With the aim of learning and sharing, Indiandotnet group & Indore Software Development Community brining a new event for you. This event will help you and your client to improve the productivity and automate your day to day work. We are very thankful to our venue partner Sky Space co-working https://www.skyspaceoffices.com/ for providing the venue. I hope you will join and grab this opportunity. This is currently, the hot topic in India who will win the 2019 election of India and become Prime Minister. Although, 90% of people know who will come again . This subject gave me an opportunity to use my favorite tools Microsoft Flow, Power BI, and Microsoft Form. 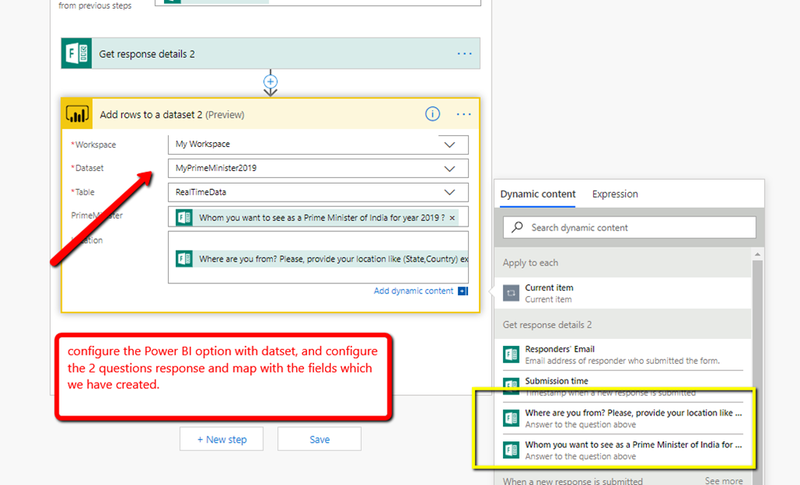 Our aim is here to create a flow which is responsible for capturing the response from Microsoft Form and send it to Power BI stream dataset. Or we can say the give live stream response of Microsoft form using Microsoft Flow to Power BI and show live trend dashboard by passing stream data to Power BI. I am so excited So, let’s get started. 1. Microsoft flow: You need Microsoft Flow account for this you can use http://flow.microsoft.com/ to create an account. 2. 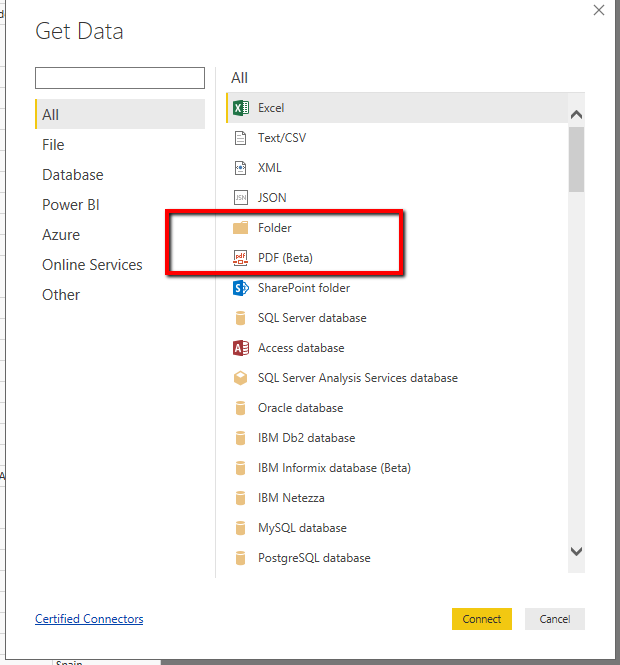 Microsoft Power BI: You need Microsoft Power BI account for this you can use http://app.powerbi.com/ to create an account. 3. Microsoft Form: You need Microsoft Form account for this you can use https://forms.office.com/ to create an account. All good now you have all the required tools. 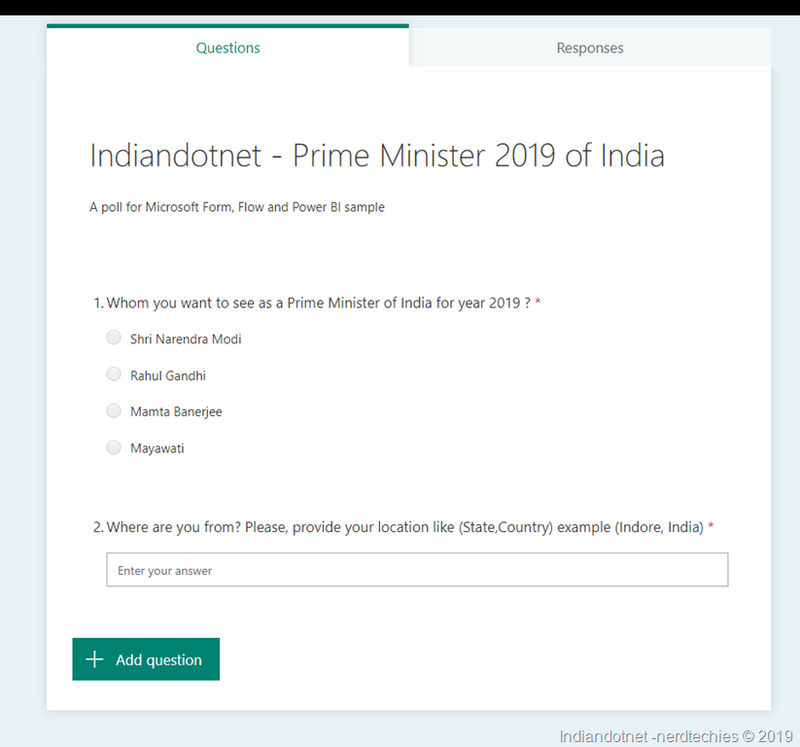 The first step here is to create a form so, just log in to Microsoft Survey form and create a sample Survey form as shown in below figure. 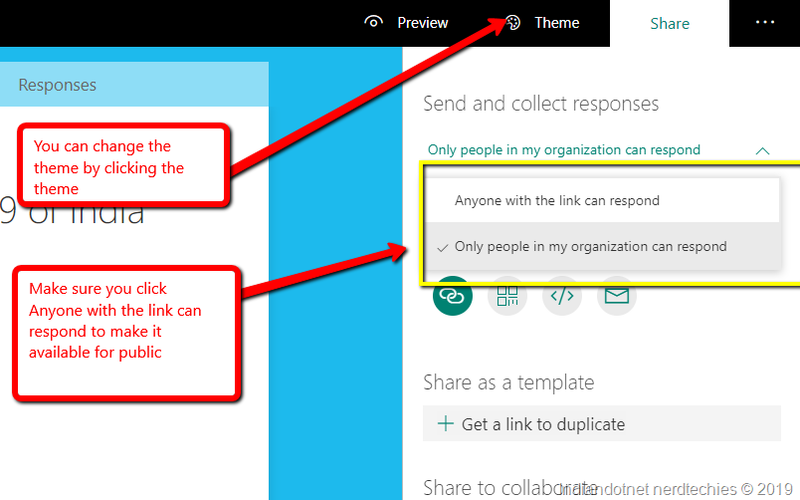 Here, as mentioned in the image make sure you click “Anyone with the Link can respond” to make it publicly available. Great, so far so good we have created our first step. 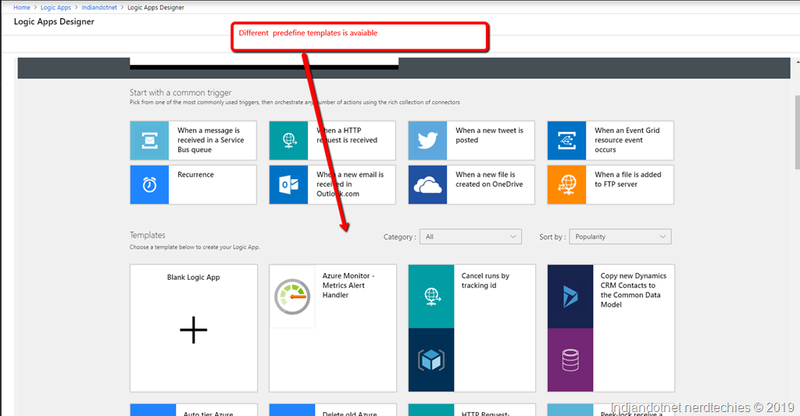 Now, Move to Microsoft Flow and after login, create a New button and choose to create blank flow. 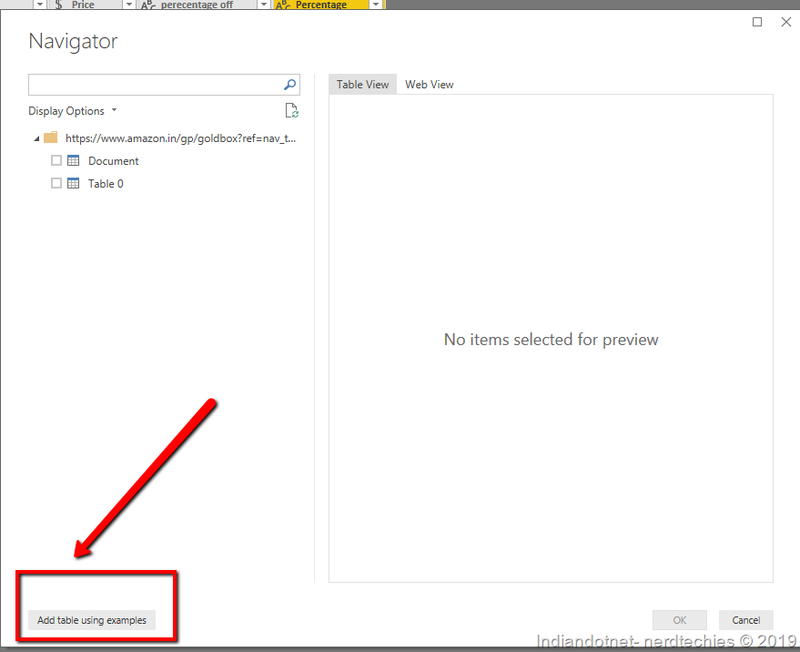 In the next step search Microsoft Flow as shown in below figure. We want to collect the response. So, whenever a new response is submitted our flow with the trigger. 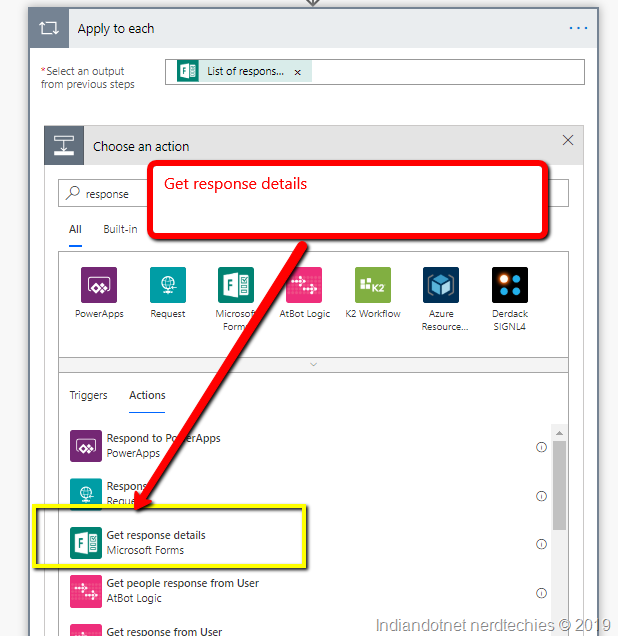 Now, when you click on “When a new response is Submitted”option (if you are already login into Microsoft form) it will show all the forms which you have created. Here, as we know there can be a bunch of response submitted using the form. Now, in the next step we will configure it as shown in the below figure. so we are going to pickup each individual response. So, our first step is created. 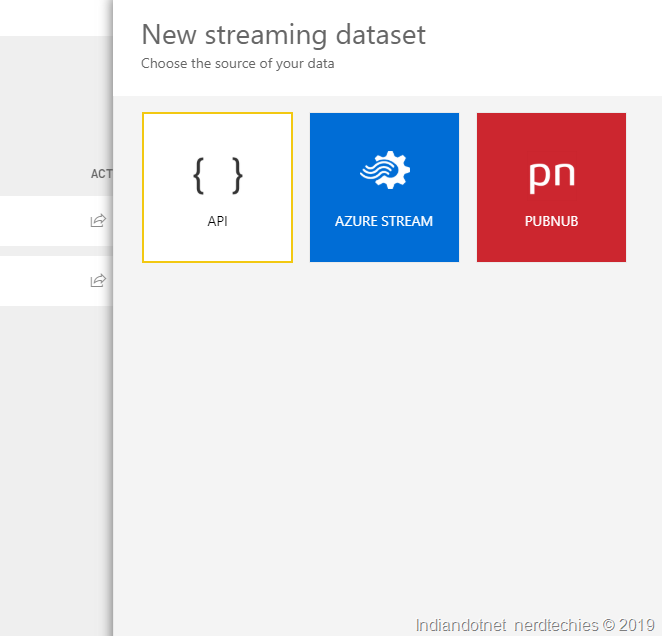 Now, we need to pass the submitted response to Power BI but before that, we have to create a Streaming dataset as we created in our earlier post as well. 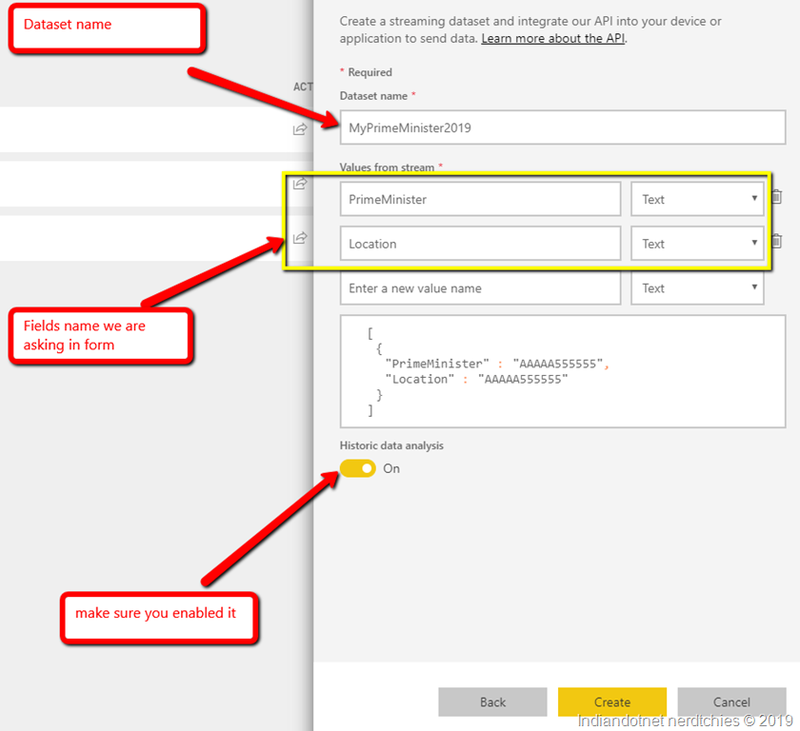 Login to app.powerBI.com and create a stream dataset in your workspace as shown in below figure. Now, in the next step, we will define the dataset in which we will have the same fields which we are capturing in the form. Just define the fields as mentioned above. You can see I have created the same as shown in the below figure. 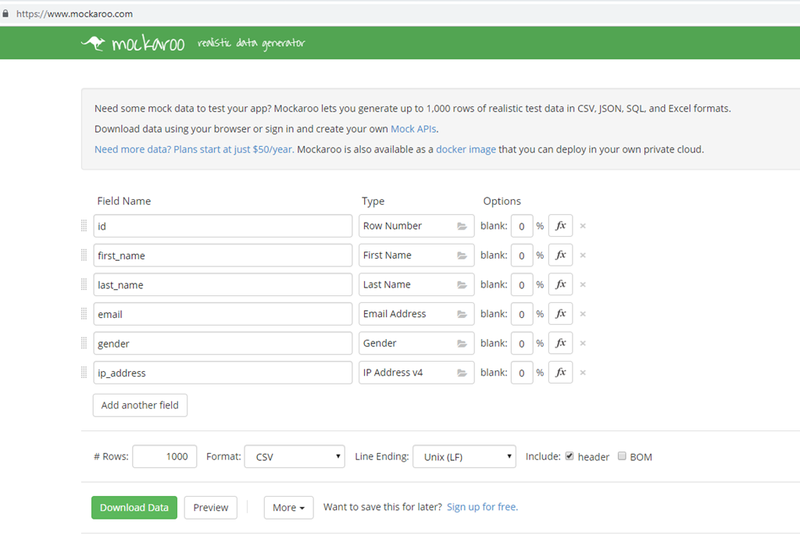 Once, you created the dataset in the next step we will create a dashboard. Although, we don’t have any data yet, but can at least define. 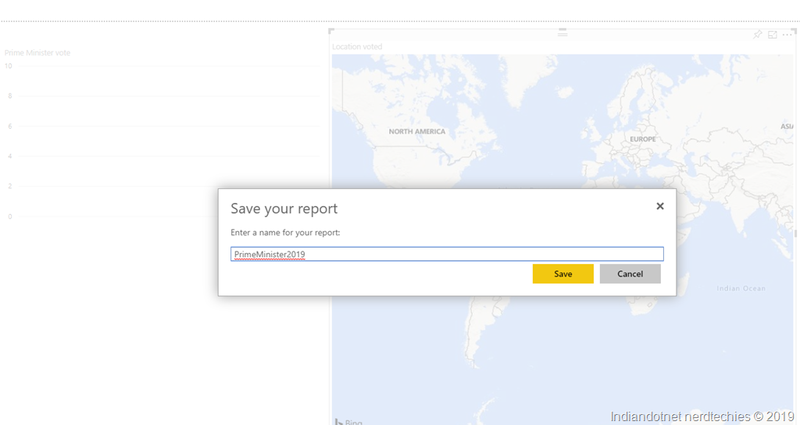 Just, create a report by clicking the option as shown in the below figure. 2) MAP – from where we got the response across the globe. Now, we are done with the Power BI stream database move back to Microsoft Flow and configure the next step which we left. so far so good, we are done with our configuration. Just save the Flow and hit test run. and you will see all steps are clear. 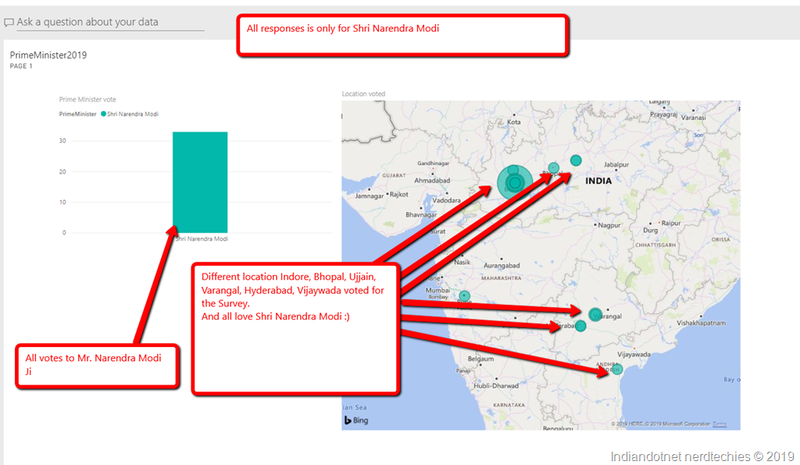 Now, check the Power BI dashboard which we have created. After configuring correctly, just publish the Survey and let the people fill it. I did the same and shared the survey on Facebook. Now, let’s move to power bi dashboard and check the graph there. Wow, we are able to see all the live response. People voted from different locations to their Primary Minister and as you can see Shri Narendra Modi is our favorite and all the people voted for him. Please, let me know how you like this post. A humble request to all the readers who are Indian and eligible to vote. Please, do cast your vote. Your vote is very important. Choose, a capable leader in this election whom you can trust that he can speak your voice logically. India will progress there is no doubt but choose a leader who will be with India not with terrorist and tukde tukde gange. 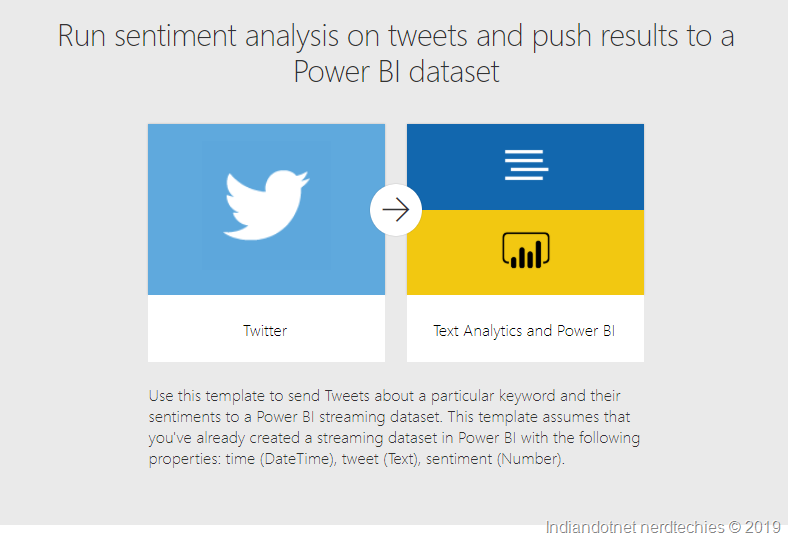 Microsoft Flow provides various templates to achieve your goal and Twitter Sentiment analysis is one of them. 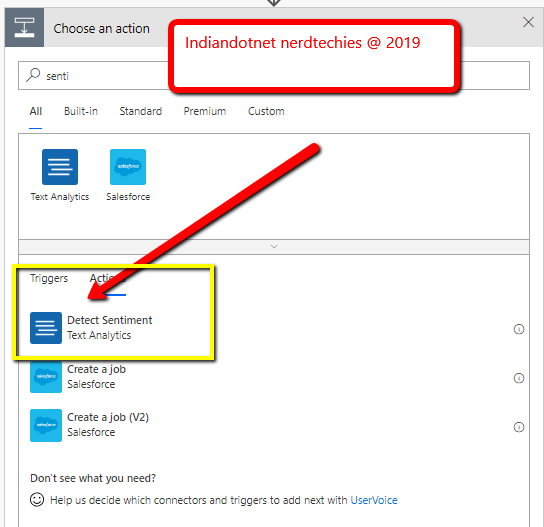 In this tutorial we will see how to do sentiment analysis using few clicks and see live graphical representation using Power BI live feed. As in India currently, #Mebhichokidar has tag is very viral. So,we are using this hashtag to cross check how it is going. 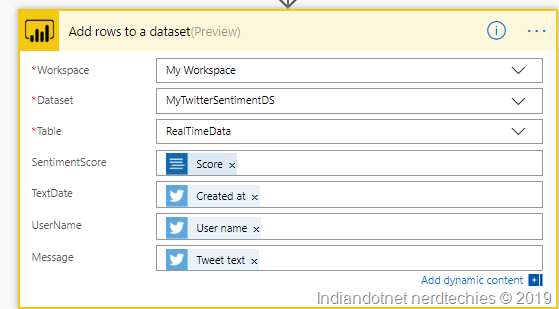 Step 1:- Just open the Microsoft flow and select the template “Run Sentiment Analysis on tweets and push Result to a Power BI dataset” as shown in below figure. 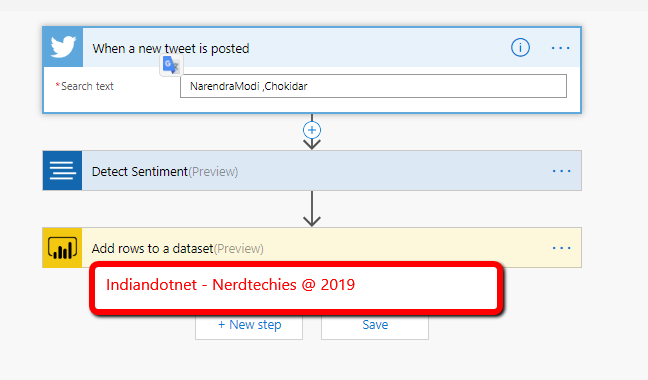 Step 3:- We have to configure 3 connection as expected text analytics connection (Azure cognitive service) , Power BI (live dashboard) connection and last but not the least Twitter connection. Here, As I am using an office 365 common account so my power BI already authenticated using that. Step 4:- Now,let me connect with My twitter account first. Which can be done by clicking Sign In. 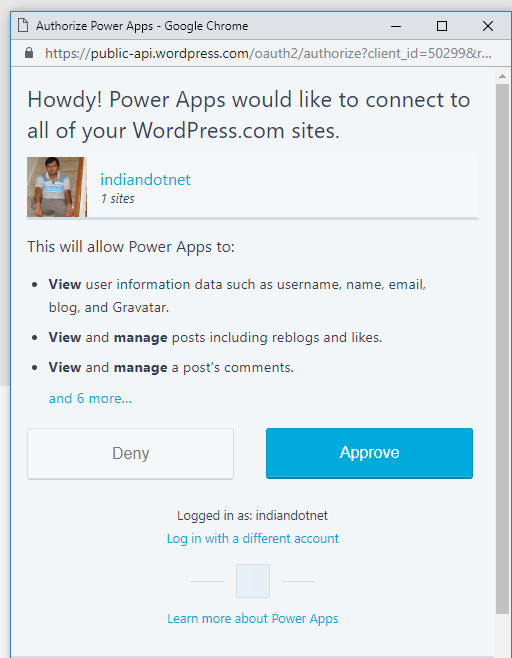 In this you need to authorize the flow to access your twitter account. Provide proper Resource Name and select pricing tier as per your convenient. I am choosing free tier for this example. Step 6: Once you created the account. You need to copy the Key from Get your Keys option . and copy the Web API option from 2b as shown in below. 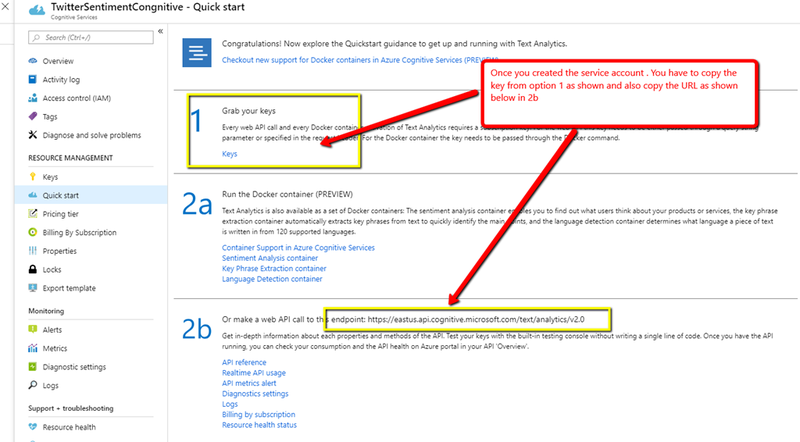 Step 7: So, far so good , we have created cognitive service and now moving back to Microsoft Flow and Configure the Text analytics. 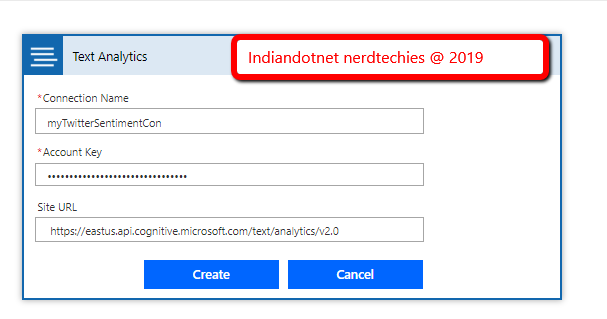 Give any name in connection name and provide Account key which we copied earlier and also copy the Web API. Step 8: Now, we are done with the connection next step is configure the steps. 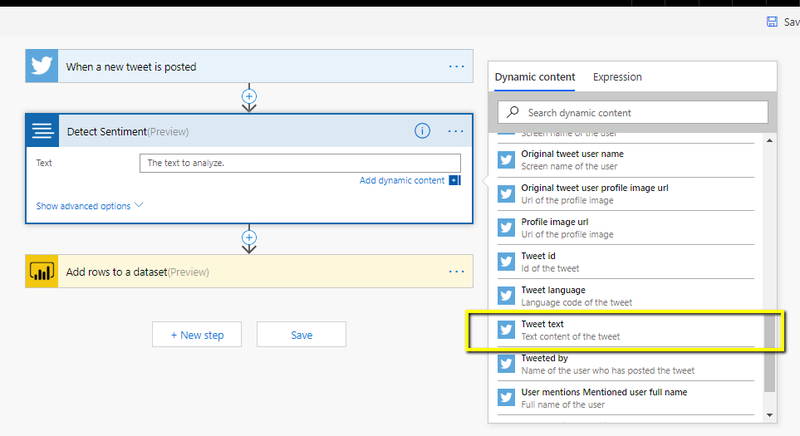 So, when a new tweet is posted we will provide that tweet to our Cognitive service using detect sentiment which will provide sentiment score. 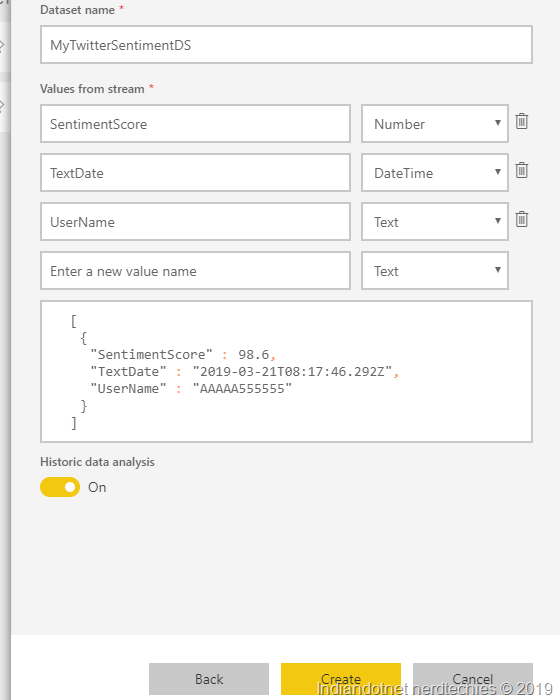 The sentiment score will be given to Power BI. Step 13:- Now, in the next step we will configure the Power BI. For which we will login http://app.powerBi.com and click on Streaming Dataset option because we are going to providing . 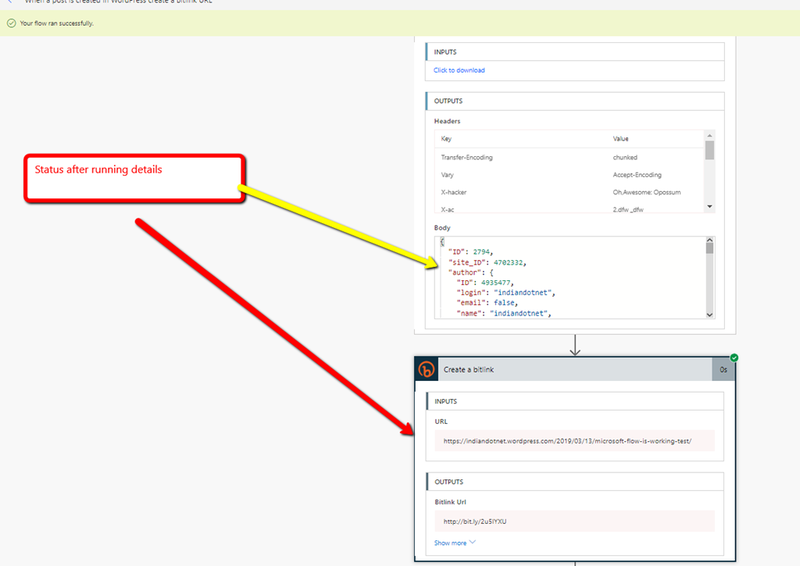 Step 14: Now, click on API as shown in below image. Once, you define the dataset click on Create. Step 16: Now, save the Report and configure the report as per your need. Step 17: Here now configure, Power BI dashboard and remove the payload. as shown in below figure. Step 18: See the below configuration which configured. 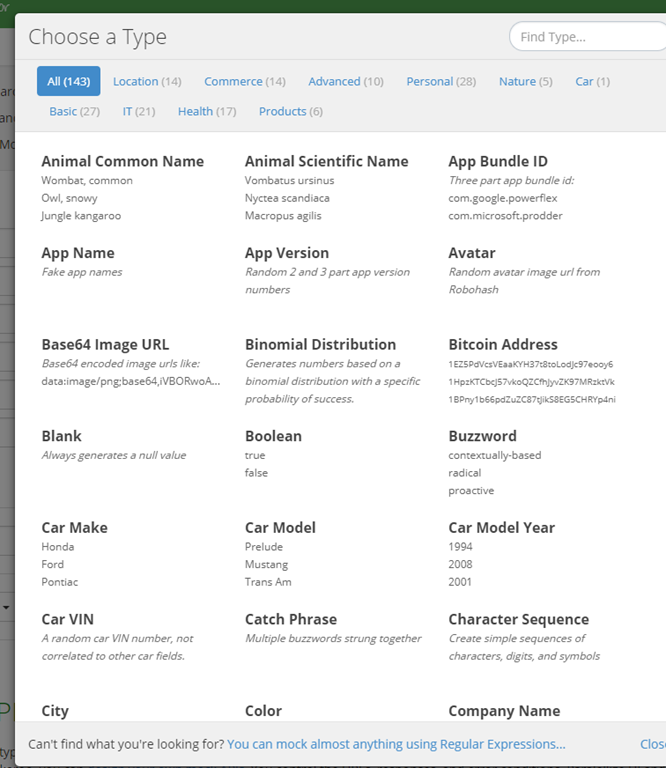 Here if you see, we defined workplace which we have created and dataset defined just above and mapped the fields. Step 19: Now, Save the flow and configuration and try to run it. If everything works perfectly. You will get all the checkbox. 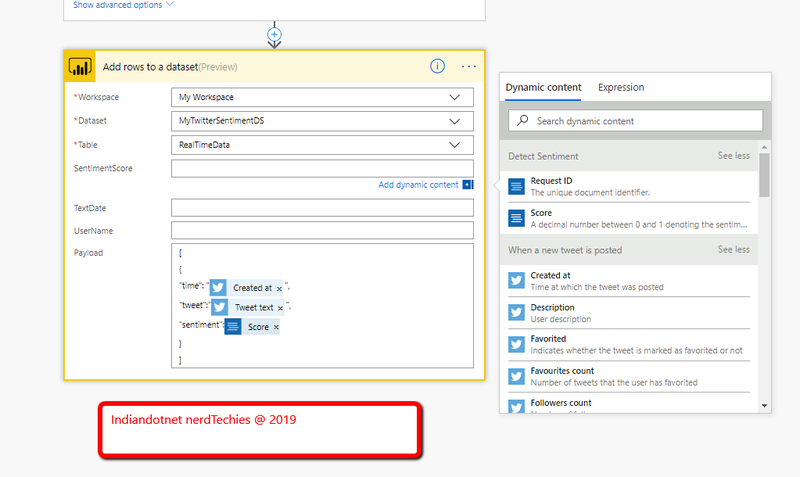 Step 20: Now, you can see the Power BI dashboard you will get the graph updating per minute with the new tweet text whenever a post with specific tag. Below you can find sentiment score graph. 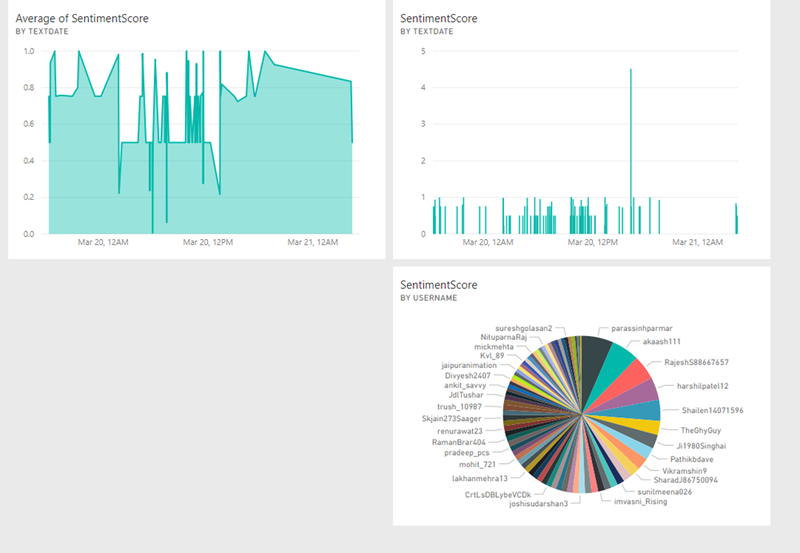 In Next post I will share the detail of this sentiment analysis data. Hope you might like this easy way of sentiment analysis. As developer /QA it is always a challenge to check the application on different parameters and Data Load is one of them. Sometimes it is not easy to generate the load manually and we may skip this very important process to check our application on different data load which may cause extra pain to our end users, customers and to our team as well. To avoid this either you yourself write some scripts (I will share an easy way to generate data load by SQL Script in near future) or use some outstanding tools available in the market. In this post, I am going to share 4 best tools available in the market which I have used and my feedback according to my experience. You can also try with trial versions and proceed further. 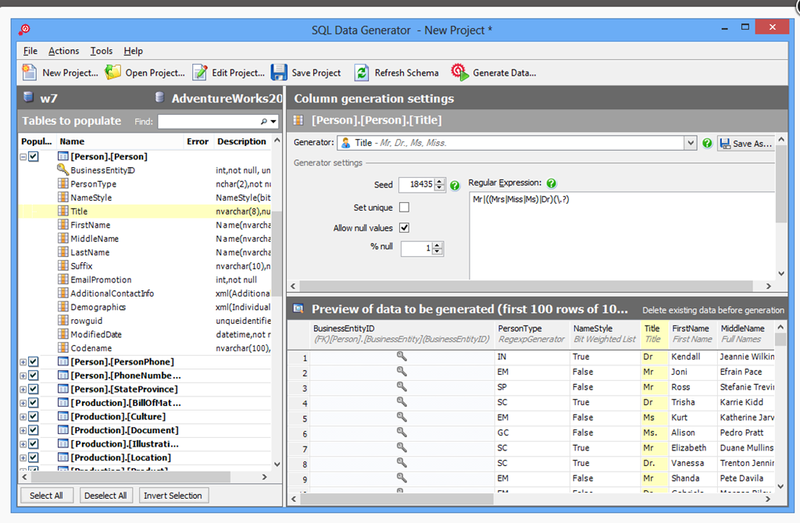 Apex SQL Data Generator is one the simple tool which I tried. It provides a free trial version for play. Below are some points which I like about this tool. This tool is not an open source but you can try this with the free version. Although it is capable enough to generate millions of records easily I faced sometimes it is slow due to a different relationship. I would recommend this tool if you want to try. Redgate is another one of the famous tools available in the market. Below are some points which I like about the tool. This tool is not an open source tool. Although, you can try a free version. I like this tool as well but you need some time to understand it. This is another interesting tool and a bit more advanced but simple. Although, I didn’t find the option to maintain foreign key. In trial run you can generate at max 100 records so, you can try it easily. This is one of the advanced tools which I found so far. 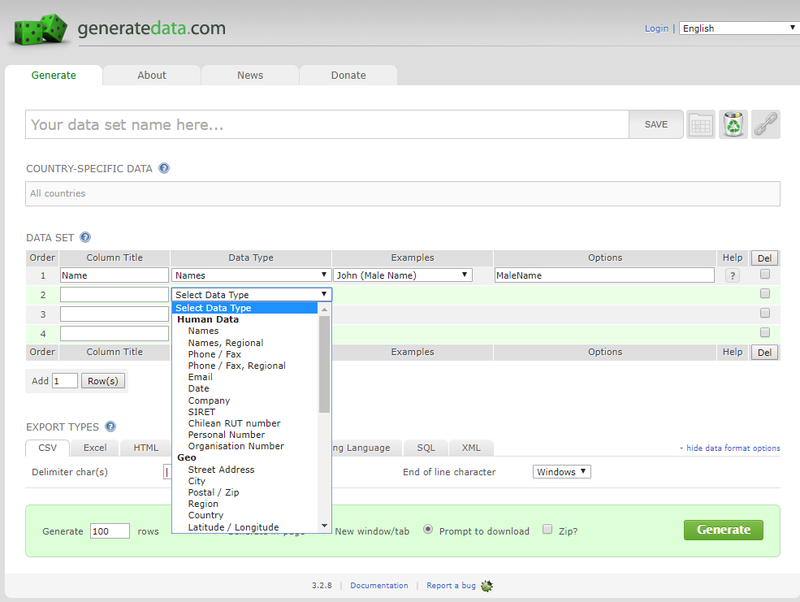 It gives you the various option of the data type. You can generate 1000 records in the free trial. Although, I didn’t found relationship (parent-child) details in this. I hope this might help you somewhere. Enjoy learning and exploring new tools. How to start with Microsoft flow ? 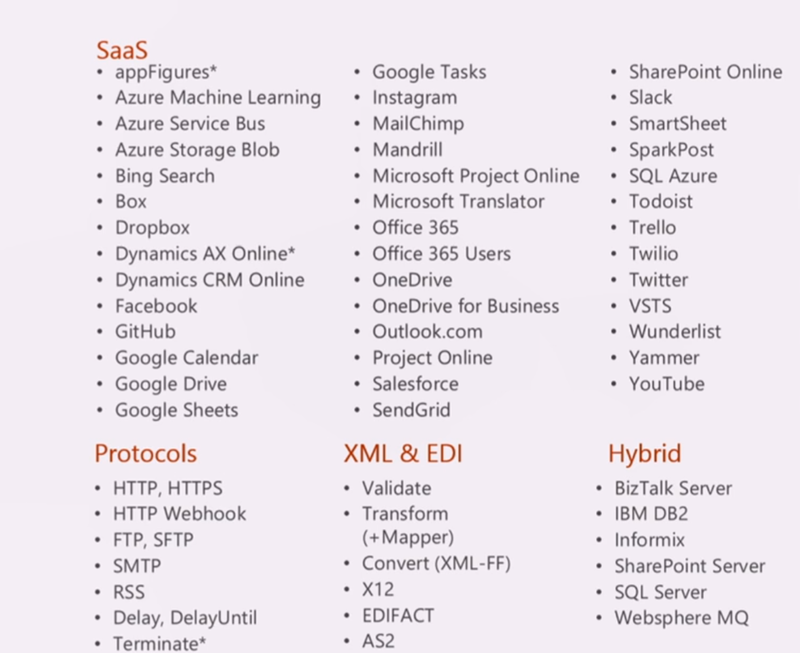 Microsoft Flow is one of the hot product nowadays and it is not new. It is in the industry from the last few years. 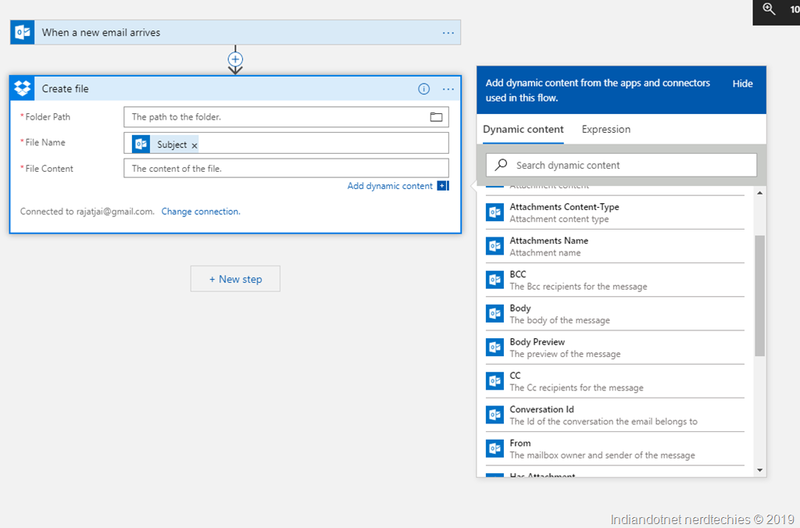 In this article, we will try to explore Microsoft Flow and know how it can be helpful to you with an example. I have changed my writing style in this blog to resolve all the question which you might have if you are new to Microsoft Flow. 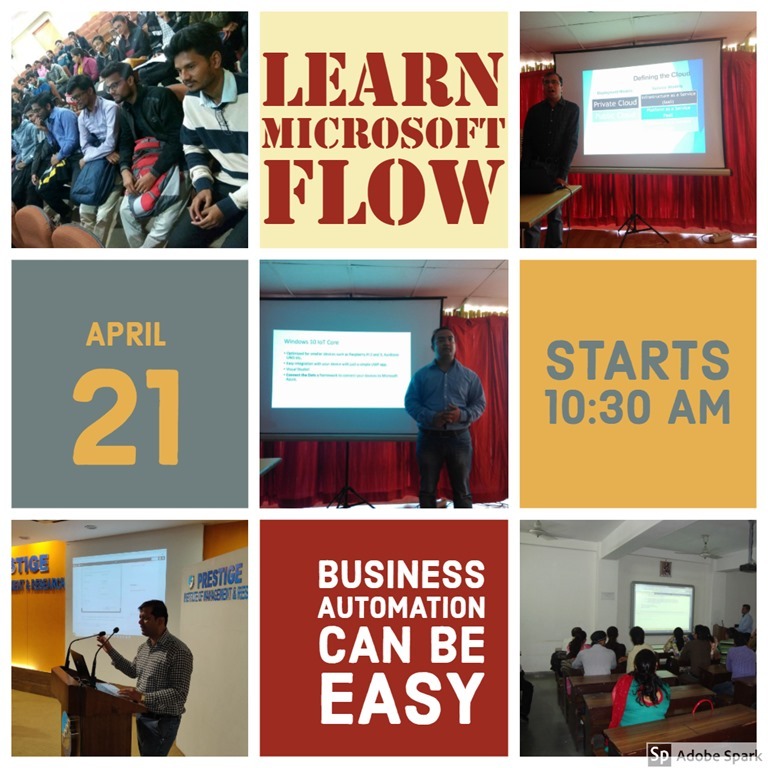 Microsoft Flow as the name suggests it helps in building the workflow to resolve business problems or we can say that It helps to automate workflow to resolve business needs or problems. It is basically part of the Microsoft Office 365 suites and mainly created to Business users or Business Analyst to solve or automate their business needs without having knowledge of different programming language like Java C# etc. It makes you smarter to solve your problem with doing automating the steps. It is a graphical based tool to design flow to resolve any problem. 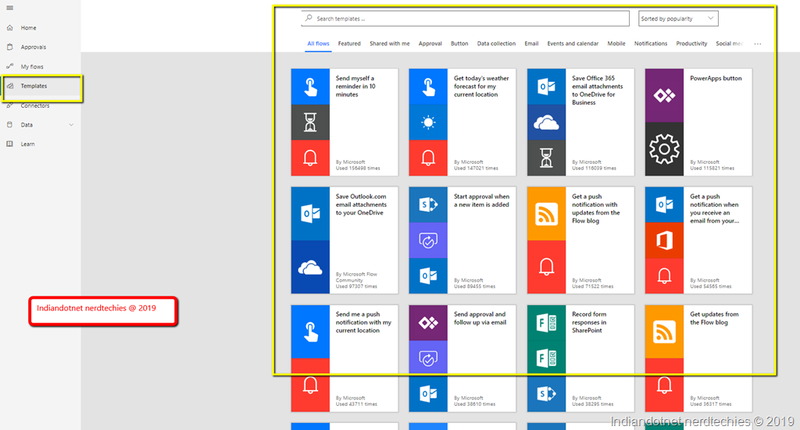 What are the different scenarios where I can use Microsoft Flow? Now, you might be thinking of where you can use this. below are several business scenarios where we can use flow. 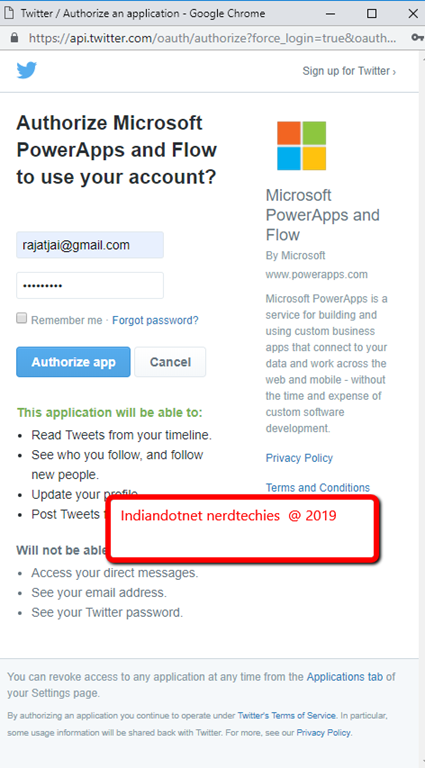 Suppose, you are a marketing team head and you want a notification on your mobile whenever any new lead is generated, then in this case Microsoft Flow will help you. Suppose, you are working on Printer server and your task is to continue watch files in a folder and if any new file arrived in that DropBox folder then you have to print it and share in the email to the XYZ person, then in this case also you can use flow. The other example is to dump the twitter data in your database. 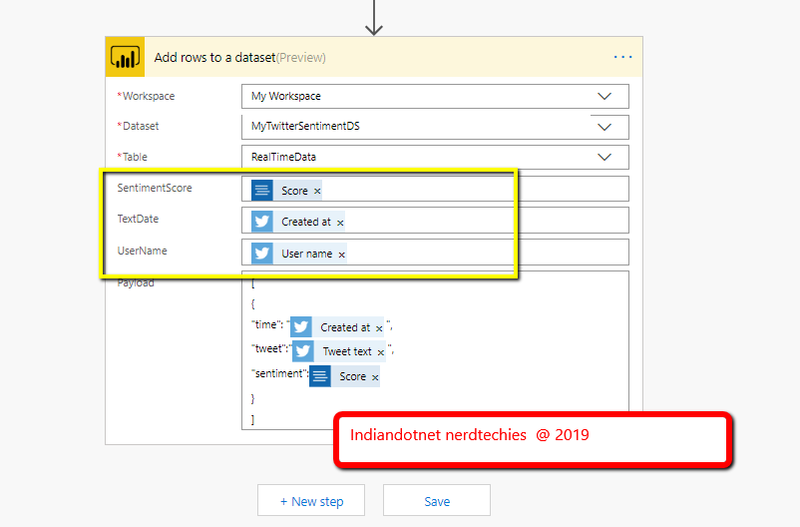 For example, you want to monitor what are the different tweets are coming on your newly launched product or product features so you can analyze the sentiments. 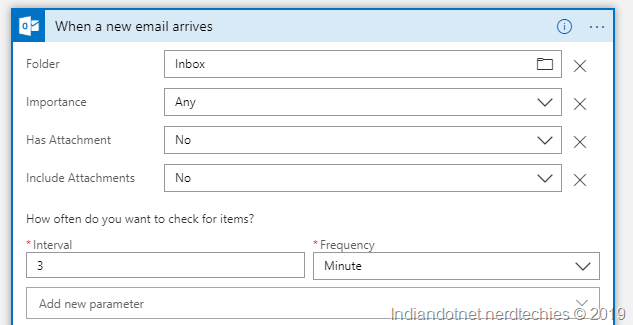 your employee added a Leave request in your portal then Flow will send an email to the manager and as a manager you can approve or hold or cancel that request either directly from outlook message of from Flow itself as per your decision the result will be updated in your portal and a notification email sent to requester employee. There might be tonnes of examples, or situations where we can use Microsoft Flow to automate and ease our work. How it is different from Logic Apps? Now, as you might have gone through my previous blogs and you might be thinking it is just like Logic Apps. So, my answer is yes, it is same as Logic Apps because it is created on top of Logic Apps. but there are various different points where it differs from Logic Apps. 1. 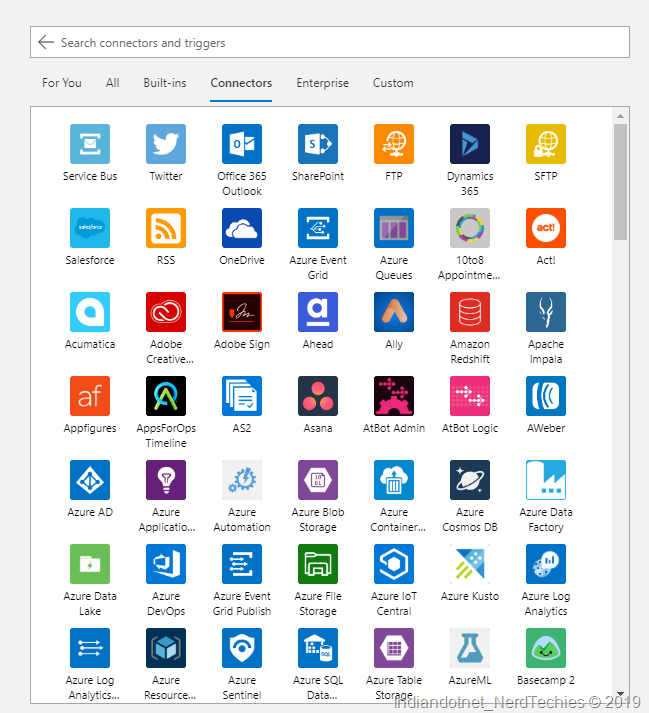 Flow is Office 365 suits part and an Individual application for which you don’t need Azure Subscription but for Logic Apps you required Azure Subscription. 2. Flow is developed for Business users /Business Analyst so, you don’t need to write complex code or modify the existing thing use Visual studio to enhance or create but Logic Apps is mainly for developers or people who have programming knowledge so if may require they can change the visual studio code. What is the first step to start Microsoft Flow? 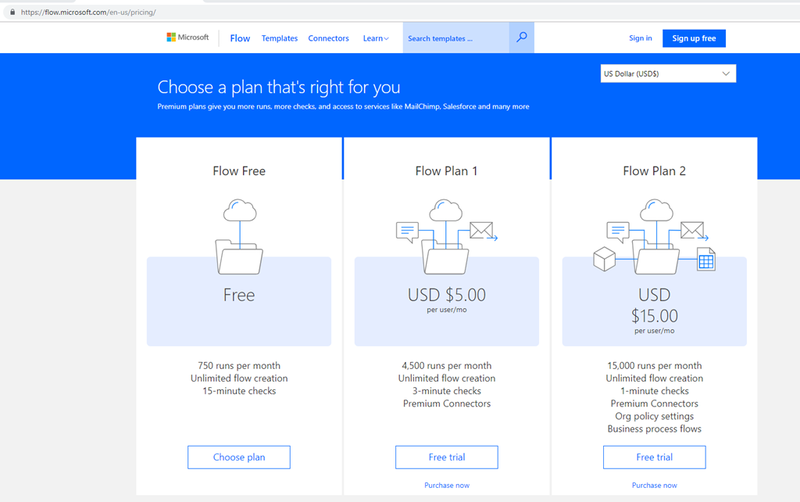 To start the flow you need to sign up on website https://flow.Microsoft.com. 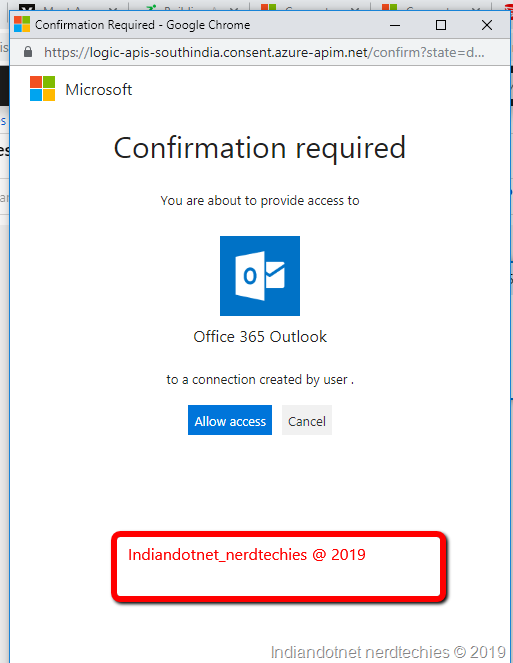 If you are office 365 users then you can sign in with that account or use any other email like Hotmail, outlook to sign up. Now, you might be thinking about the pricing. There are 3 different plans available, free, Flow Plan1, Flow Plan 2. depends upon your need you can choose any plan. Once you opted the plan and sing In after login you will get following home screen to proceed further or we can say this would be your play area where you can create different flows. Now, as mentioned earlier it is most likely Logic Apps. So, similar to Logic Apps it has the various connector. Just think if the concept “if something happened then we have to do something”. So, basically this is based on Trigger and then Action. concept. Example, An email came to your inbox (Trigger) then (Action) send a mobile notification. There are more than 200+ connectors available to help you and ease your work. Can we have a step by step example to try it out? Yes, and believe me this is one of the important examples for all the blogger and they will surely, like it. For a blogger the challenge is promoting his/her post and for which he/she needs to create a shorten URL either on (goo.gl or bitly.com) and then share on Facebook, Twitter or other social media channel. Now, this is again a time-consuming process. Now, what you think if we can automate this process. 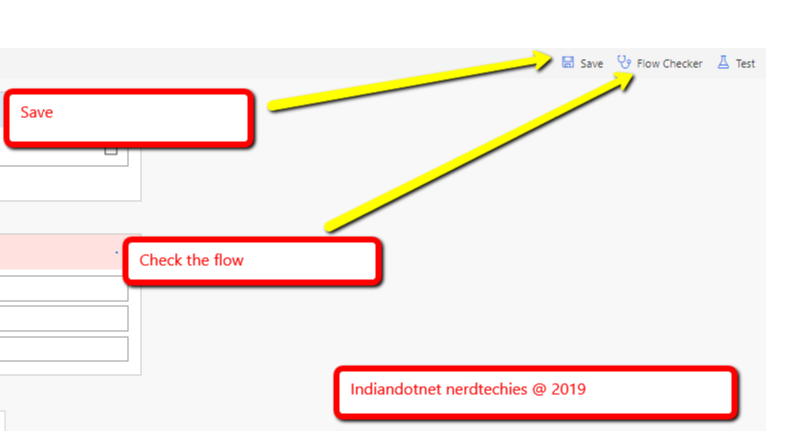 So, our challenge is whenever a new post is added in the blog then our flow identify that trigger and then provide that link to bitly.com and create a short bitly link and then post the generated link to social media (but in this example I created the notification to make it short and sweet choosing existing template ). Now with the assumption, you already created your account in the Flow and logged in successfully. we proceed further. 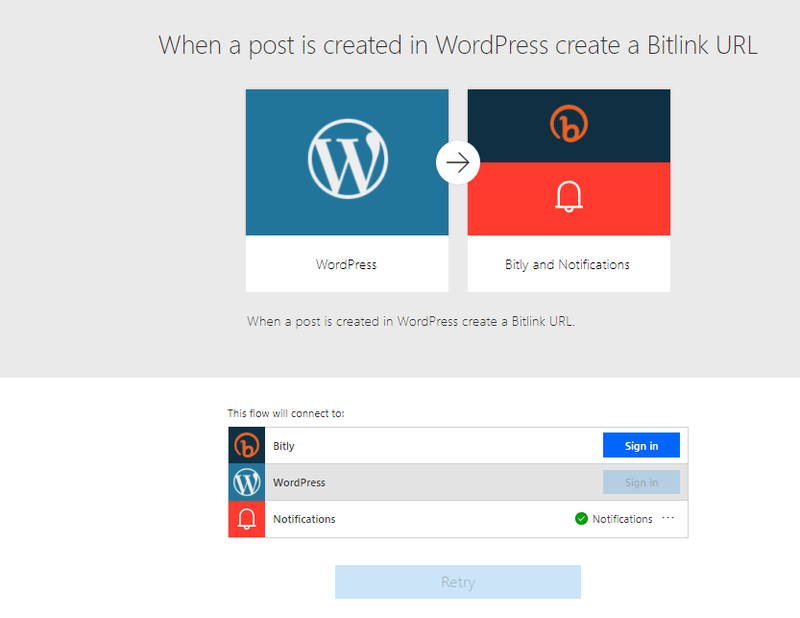 Step 1: A an existing template “When a post is created in ”WordPress create a Bitlink URL and send the notification” as shown in below figure. 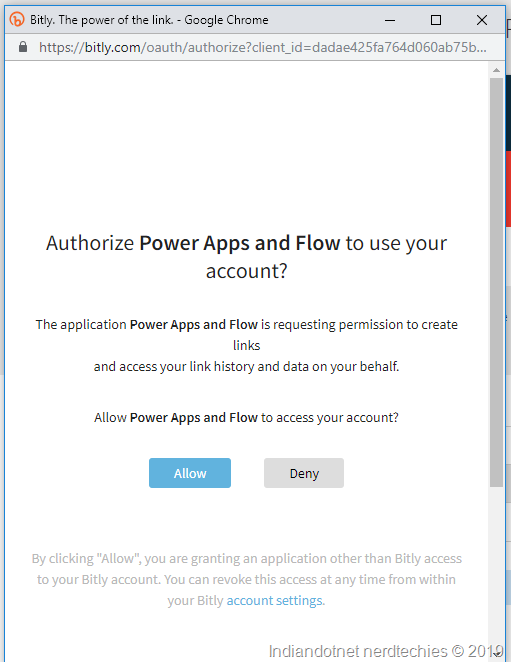 Step 2: Now, as you can see we have to configure the btily authentication and allow Microsoft Flow to access bitly.com to create URL. as shown in the figure. Step 3:- Once you allowed it. in the next step, we have to give authentication and authorization to access our WordPress blog. So, whenever a new post came flow will identify. so, just provide access as shown in the below figure. Step 4:- so far so good we have given authorization for bitly & our WordPress blog. we don’t need to configure the next step because it would be automatically configured. Now, we are good to go. we have configured perfectly in a few clicks, just save the Flow and check the flow using flow checker option. 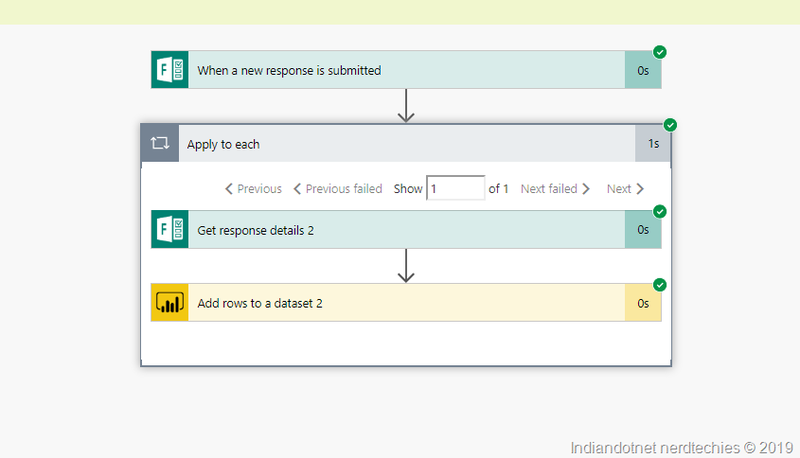 If there is no error you found in Flow Checker just click the Test option as shown in below figure. Step 5: Now, go to your blog and create a post and publish it. You will be surprised that your flow automatically identified the new post and created a short URL and notify you as well. You can see all the flow steps are checked it means the flow is successful. Step 6: Now, you can check bitly.com and you can find the URL is created and also you got the notification. So we are good with the flow example. As a product owner, you always worried about the different security aspect of your application and SQL Server Database is one of the main important parts for which you might worry. And obviously you might have purchased different tools to this assessment as well who will provide you security loopholes but when we talk about Database the option is limited and some options are very costly. 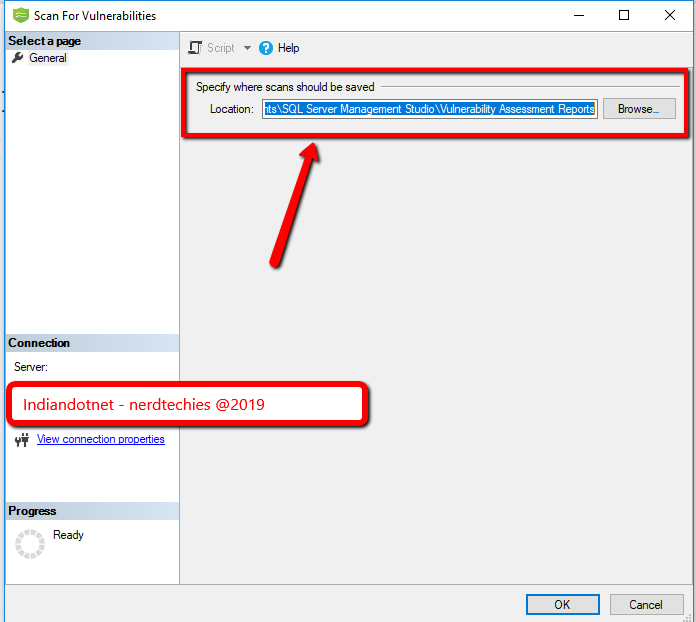 With SQL SERVER 2017 latest SQL Management Studio your one of the problem will be resolved cross-check your database vulnerability. You heard it right. 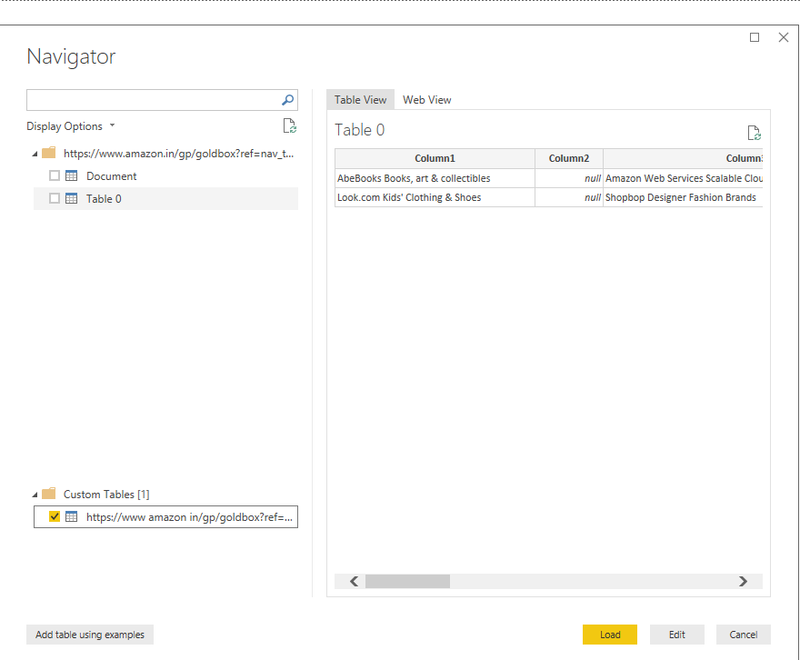 Although, this feature is already available in SQL Azure but now you can do this assessment of your database using SQL Server 2017’s management studio. This vulnerability assessment report can be generated on the database with few simple clicks and you will get different High, Medium , Low risks of your database. The vulnerability assessment report not only provide risks details but also help you to identify which category of it and this will not stop here you will get a recommendation as well to fix those problems. Sometimes , you will get direct scripts which you can run to fix those issues and sometimes you will get the links on how to implement those. Before starting to make sure you have SQL Server 2017 Management Studio’s latest version. Step 1: Once you opened the SQL Server management studio right click on the database which you want to cross check. in this example, I am using the AdventureWorks database. As shown in the below figure. Step 2: Now, as we are doing it the first time so click on Scan for Vulnerabilities option. and you will get the following screen where you can provide the location of scan file. Step 3:- Just click on OK button to proceed further and wow you will get all the loop holes of your database. You can easily check what are different points on which your Database is failed with risk Assessment. As shown in the above figure , we have 6 check points on which our database failed in which 1 is on high risk , 3 medium risk and 2 Low risk. And if you see carefully there are different categories as well like data protection, Authentication and Authorization, Surface Area Reduction etc. Here as the name suggest Data Protection is mostly related to encryption of your sensitive data like SSN, DOB etc or TDE. Authentication and Authorization is more relation to login access of the database. Step 4:- Now, move a step further and click on any row in the grid. You will find the details of the row just below the grid. As you can see in below image when we click on data protection it suggesting the column names which come under extra care and to on which we might think to apply encryption. Step 5:- The story does not end here, for some of the problems this assessment report provides script as well and if the script is not possible then provide a reference link to resolve that issue. As you can see in below screen we are getting recommendation scripts to apply. As you may aware Microsoft Azure provides you a bunch of services, feature and Azure Logic Apps is one of the best Service which Microsoft provides to automate, orchestrate tasks, business process etc. Logic Apps is the simplest visual designer solution to solve your simple to advance problem without writing a complex logic. I know you might be thinking where we can use this. So my answer is everywhere in your business where you might need some kind of automation. Let’s understand the need with a few examples here. Example:- Suppose, you are a business owner and most of the customer contact you via email. So, whenever a mail comes with subject invoice or new order you read those email carefully and depending upon the the subject you either send then to Account department or Production team moreover if the email is coming from new client then you add his basic details in your system and once the production team update status of work complete and notify you. You again send the completion confirmation to end client. Now, all these processes which we have gone through are in the different system and most of them required human interaction, for example, identifying the new client and firstly make their entry in the system. 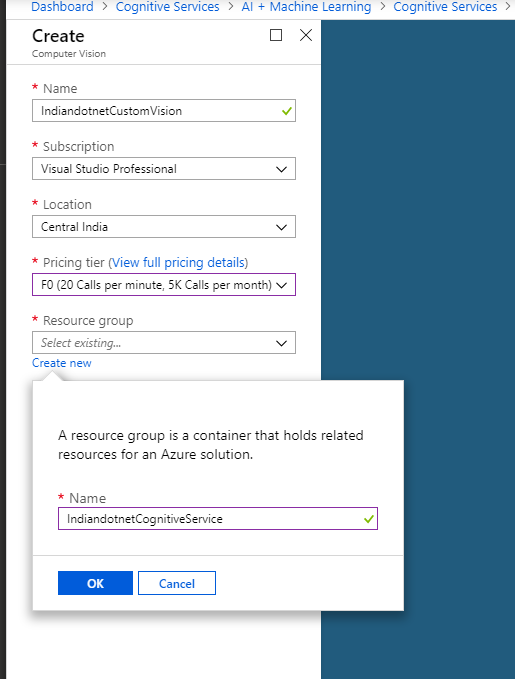 So, this whole process can be automated using Azure Logic Apps. 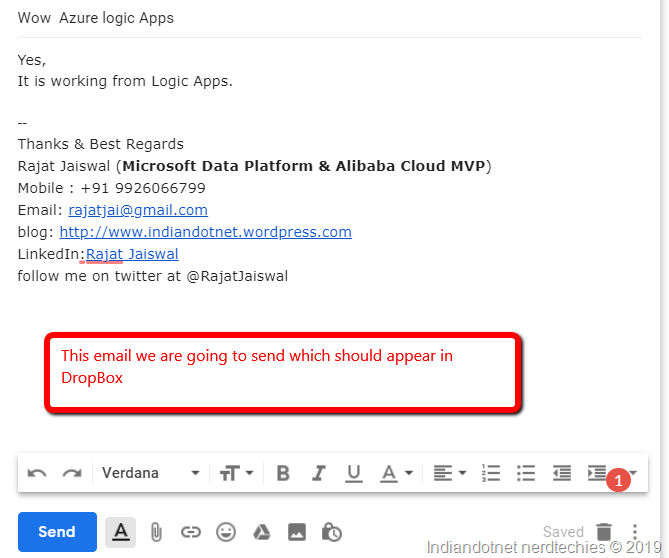 So, in the above problem, Azure Logic Apps firstly read your email and identify the specific subject’s email. Once those identify check the email address in your client repository whether that exists or not if not exists then will add in the client repository. In the next step, Logic Apps send detail to the production team or Account system. Also, keep eye on the database of the production team and when they trigger order complete send an email or SMS to end client. And believe me, all this complex logic you can achieve in Logic Apps without writing complex code but using designer object provided in Azure logic Apps. One more thing which I have faced personally if you worked in supply chain system especially E-Pedigree, EPCIS & EDI then you might need to work on complex XML, AS2 format files for which you have to write complex code but with the help of Logic Apps this can be few steps job and without writing any complex code. 1. Connect with Facebook and find the negative post and remove from your wall. 3. Fetch newly added detail from SQL Server/ CRM/ Sales Force and send a welcome SMS or Email. There are tones of the example where Logic Apps workflow makes your life easy. Let’s understand the main component of Logic Apps which is a Connector. These connectors will help you to connect with various API, protocols, integration account and enterprise account connector. Now, to proceed further let me tell you there is more than 200 connector (predefine components) available to help you in achieving your goal. By the name, it is clear that Action is the action item needs to be taken and Trigger will help us to define when to take the action. Now, Lot’s of theory here let’s understand this by a step by step simple example. 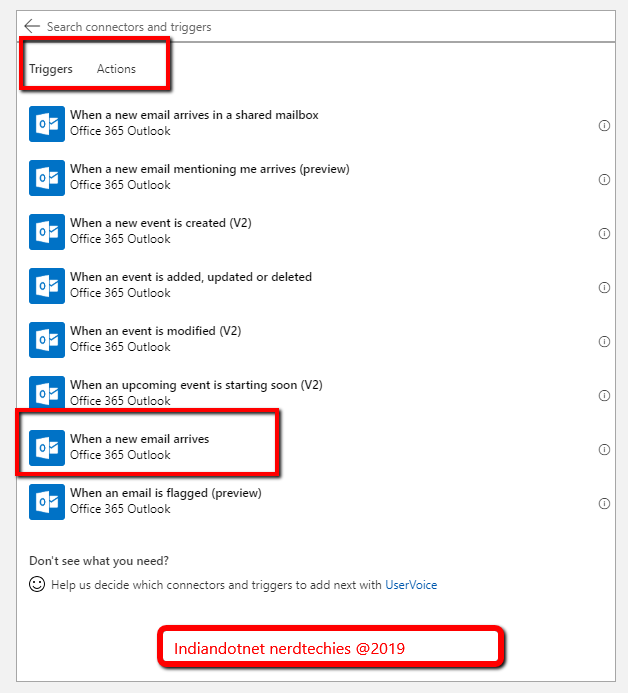 The problem statement is whenever an Email comes to our Office 365 account we will create a file in Dropbox and the file will content the email body. Isn’t it cool? Prerequisites:- The first and most important prerequisites here is that you should have Microsoft Azure portal Account. 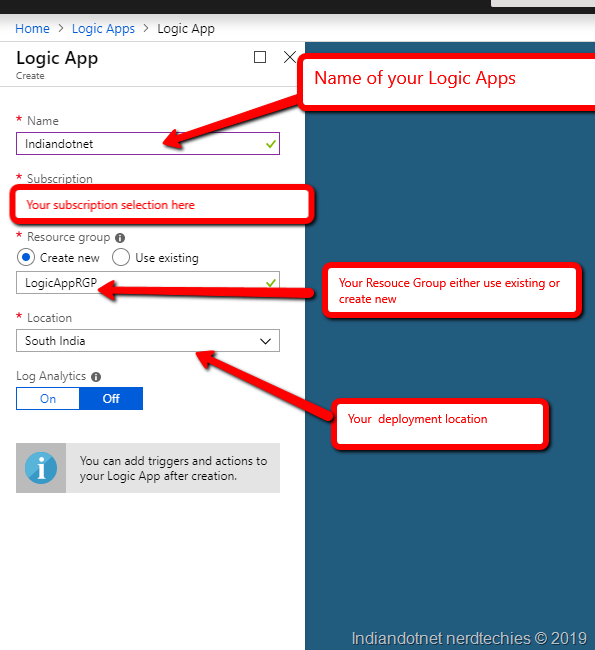 Step 2: Once the login is done the next step is to click on All services and find integration option when you click on that option you will get Logic Apps option as shown in below figure. Step 3:- You will get the following screen after using Add new Logic Apps option. 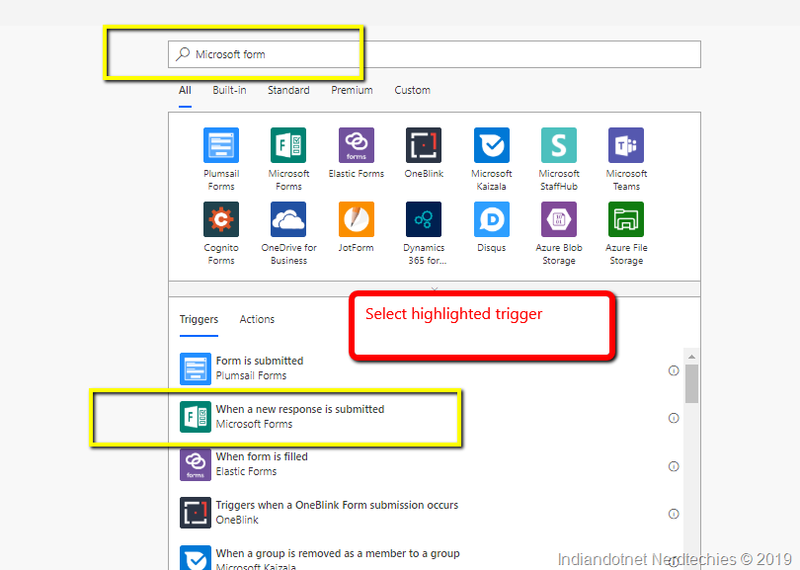 Where you need to provide your application name and select the subscription, and use the existing resource group or create new. At last, need to select the location where to deploy the app. Once you are done with this just Click on Create button in the bottom of the screen. Step 4: – Now, it will take a few minutes to complete and you will get following notification that application is deployed. Step 5: Now open this application by going back to Logic Apps Resource Grid or Pin the Application on Dashboard by clicking Pin To Dashboard option and open from Dashboard. Step 7: You will get the following screen after clicking New Logic Apps option. Step 10: Give proper credentials and allow the Logic Apps to access Office 365 email. Step 12:- Now, what we need to do here, whenever a new mail found we will create a file in Dropbox. 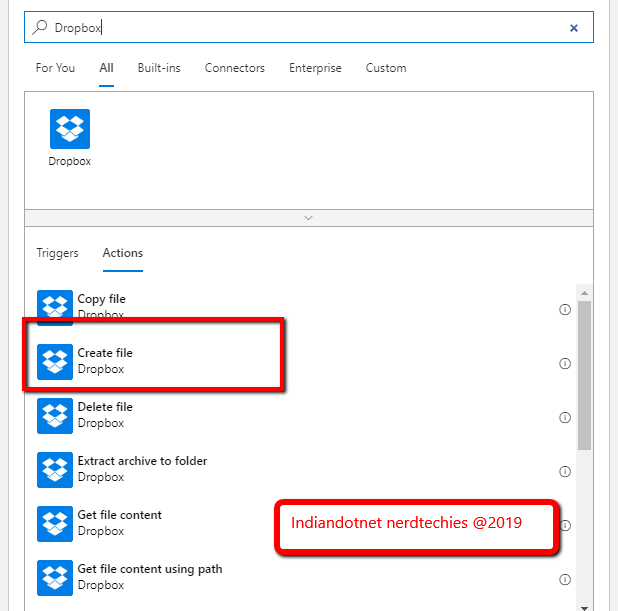 So just add Create a file in dropbox connector for next step. 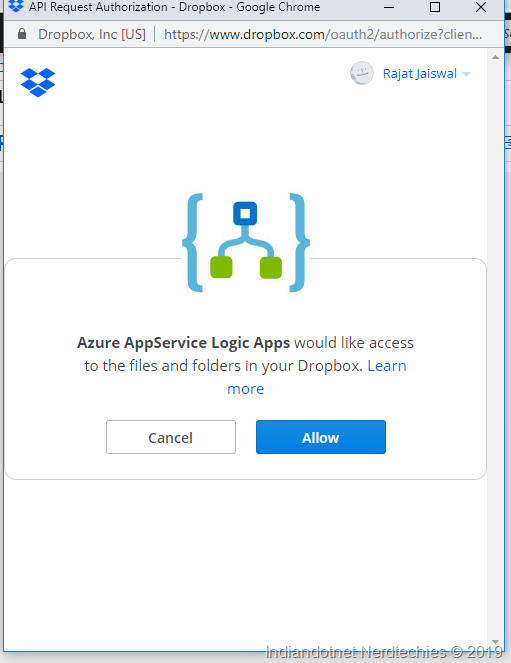 Step 13: As obvious, you have to provide drop box access to Logic Apps to further action. So, just press the allow button. Step 14:- Once you authorized in the next step you have to configure the dropbox like where should we save file folder path in the current example we are saving the file in root folder. Next what is the file name so, we are creating email subject as the file name. and to view it properly we will append the extension HTML in the filename. Next property is file content, so we are going to save email body (email content) in the file. You can configure the properties as per your ease. Step 17: Now, once we send this email to my office 365 account. The logic app should create a new file in my dropbox. 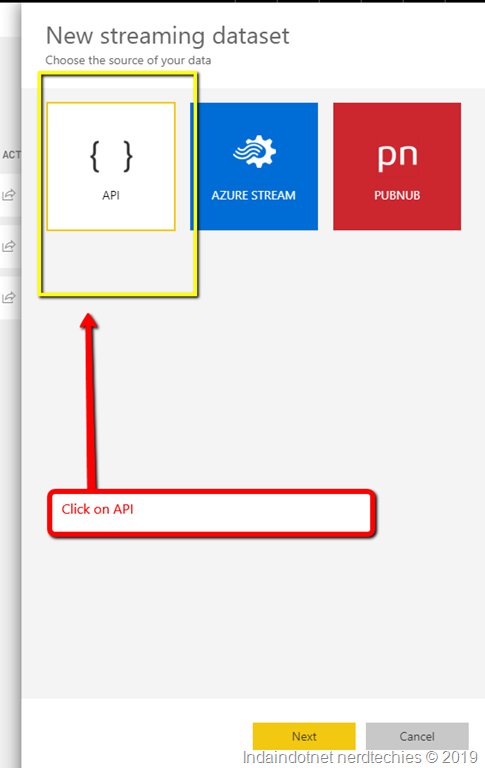 As you can see in below figure it showing WOW Azure Logic App.html as expected. Step 18: Now, we will try to open it and check the content of the file and WOW, it is working as per our expectation. 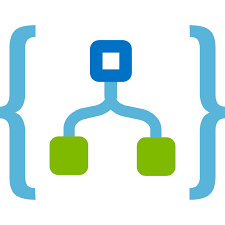 So, we have created our first simple Azure Logic App without writing a single line but handled a complex logic. 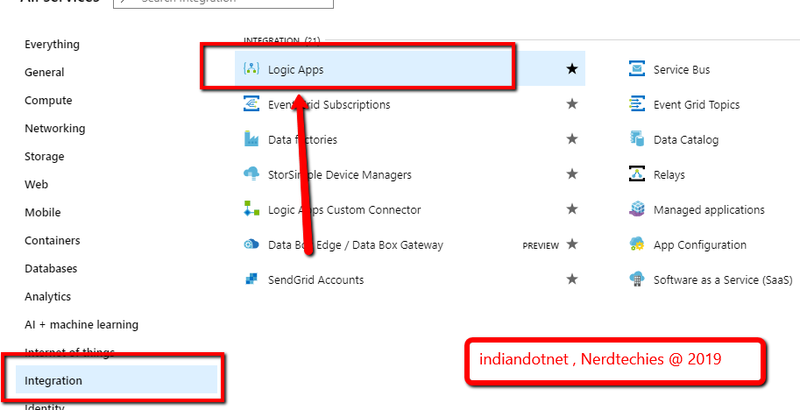 In my next few post, we will see more inside of Azure Logic Apps. I hope you may like this post. Whenever we talk about web scraping or web data extraction we always think it would be a difficult part and trust me to exact HTML code and fetch what is needed is a bit complicated not an easy task. But Power BI made it very easy to extract data on which we can do the analysis. 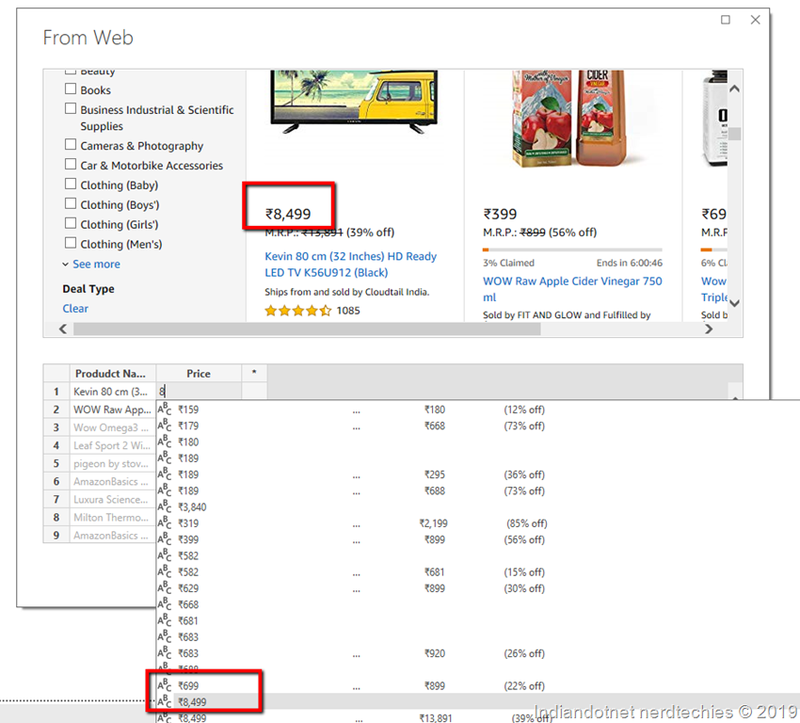 Let me take an example here, suppose we want to create a tool which extracts data from different shopping site and compare them to get the best deal of particular product. This extraction of the data and comparison can be easily done in a few steps in Microsoft Power BI. Let’s understand it more using hands on using few steps as mentioned below in this post. Step 2: When you click on OK button you will get a new popup windows in which power BI tried to extract the data and provided you tables as you can see in below image there are two tables which Power BI provided Document & Table 0. Step 3:- After clicking the button you will get a new popup screen as shown in below image. You can see there are 2 parts in the popup the first part is the web part view and you can see the page from where we want to extract data is visible here. 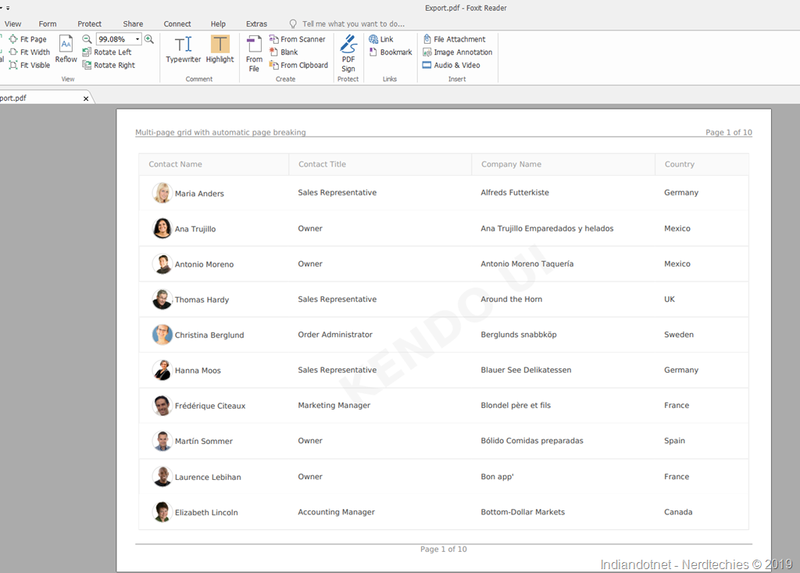 The second part is table structure which we are going to create by giving a few example to Power BI. Step 4:- Now, Here we have to extract the Product Name, Price and percentage offer. So we are going to train the Power BI with 1 or 2 example. So , Let suppose Column1 will hold the Product name . As we can see the product Name in the web page is “Kevin 80 Cm”, “WOW Raw apple” etc. 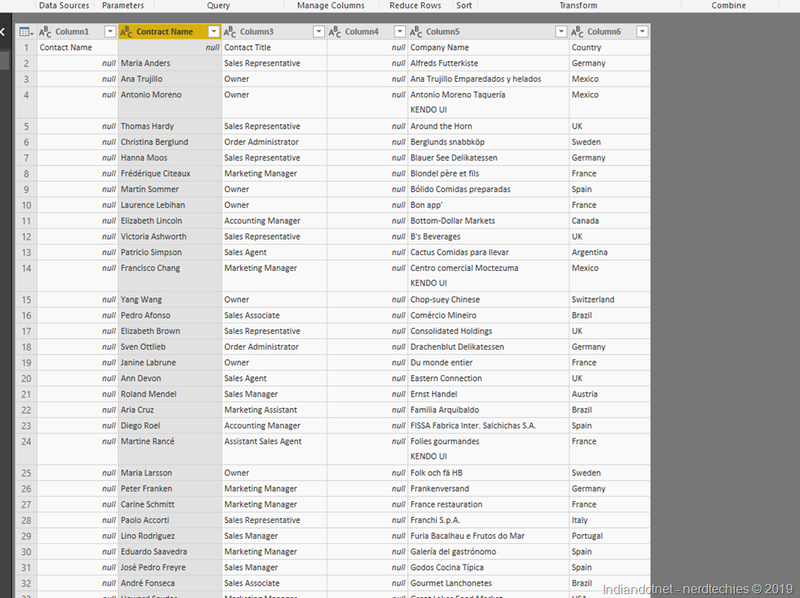 So , in the first column, we will try to write Kelvin and what you will see a list of data which Power BI extracted. Just select exact name, just follow this step for 2 or 3 rows and you will be surprised to see that rest other row data will fill automatically. 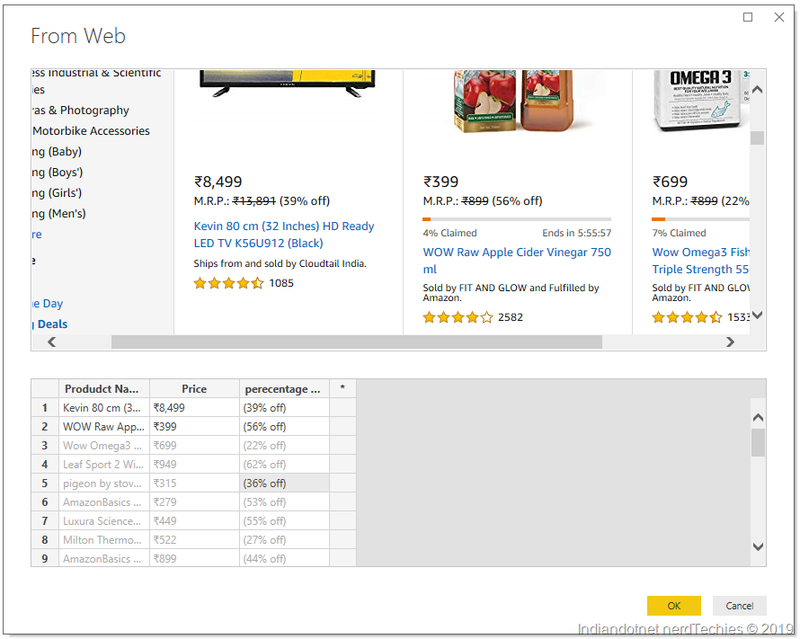 Step 5:- Now add another column in the below table where we will keep the price of the items. so as you can see for the Kevin 80 cm TV the price is 8,499. So, when you click and try to write the amount of 8499. 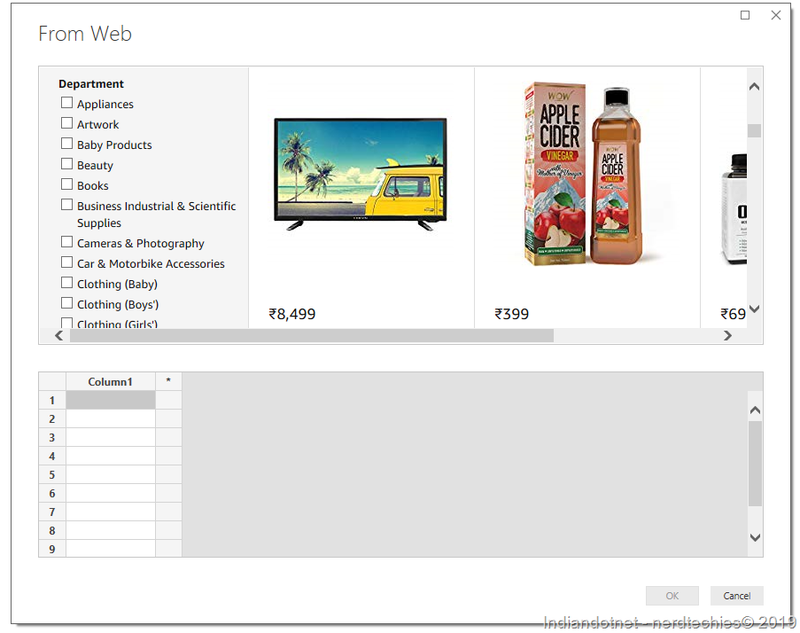 Power BI is intelligent enough to provide the list of extracted data with similar value. 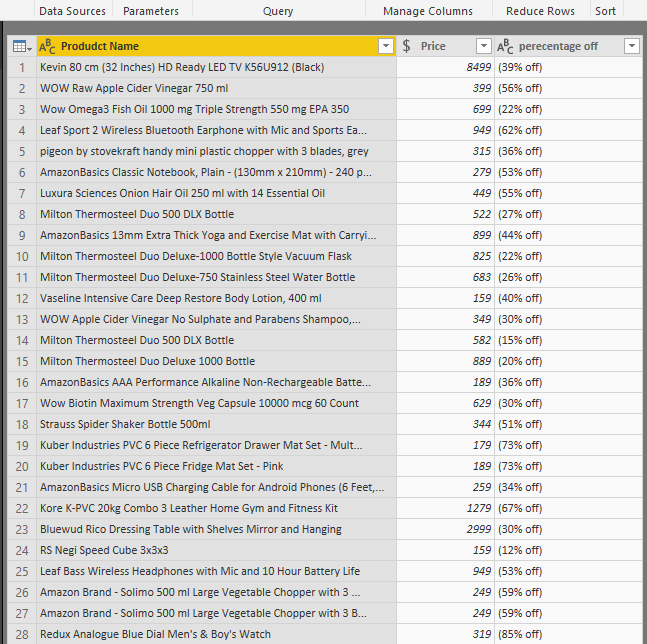 Just try the same step for next 2 or 3 rows and you will find all the prices against the product name. Step 6:- Now, we will fetch data of percentage off . As you can see for kevin TV price is 39% off. so , to achieve this just add another column in the grid and try to type 39% . As you can see in the below image. 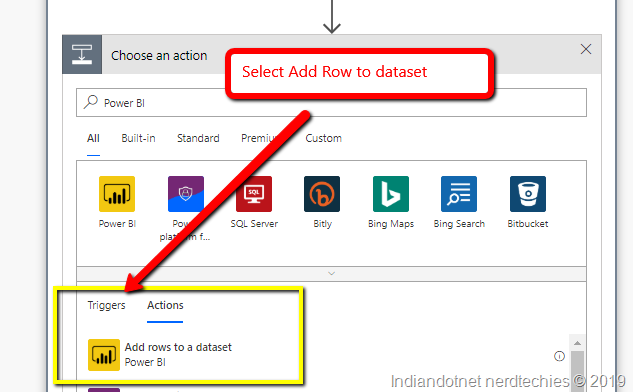 Just repeat the step for few other rows and Power BI will do for rest other rows. Step 7 : Wow, you have extract the data which you want. so far as you can see in below image. Step 8: Now, Just click on Load button to proceed further you will get the following screen. Proceed further by selecting Custom Tables . Step 10 : The only thing which might be bother you that in Percentage Off column you were seeing brackets and % Off extra text as well. Now, to avoid this just add another column by example as you can see below screen. Step 11: That’s great now you have the data which you want. Now, we have data so we can apply any analysis which we want. Hope this feature might help you. Although, in every month Microsoft Power BI team bringing new features to make Power BI more robust tool. 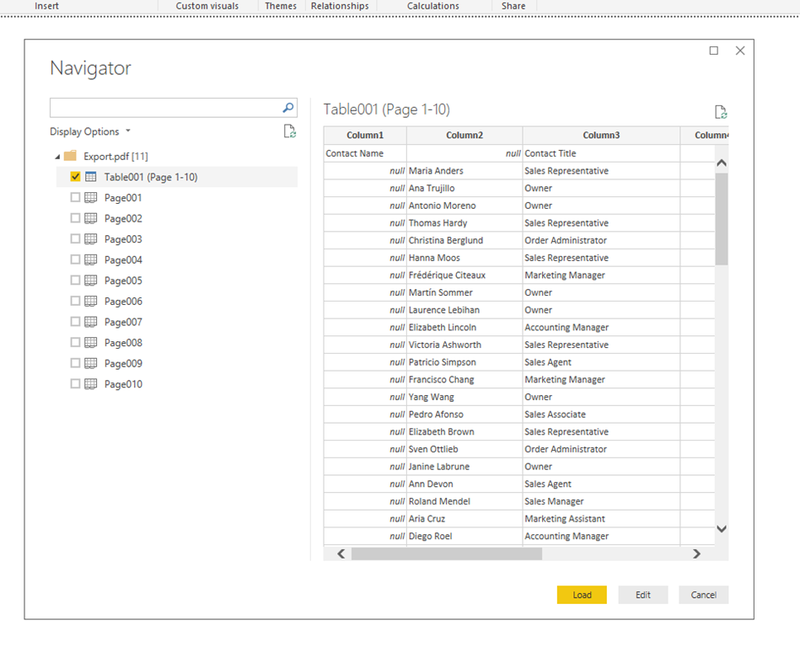 To add a feather in the cap of Microsoft Power BI tool, Microsoft Power Team introduced a really exciting feature which is import data from PDF. There is the various scenario where we have to deal with PDF data and do some fruitful operation on it. I hope this new feature will help us in those scenarios where the data source is PDF. Isn’t it cool? Let’s experience this feature by using some hands on. 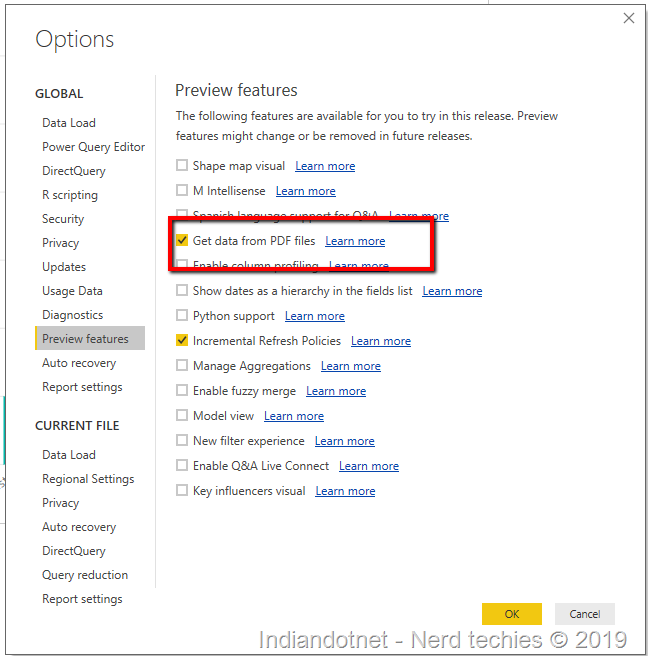 Prerequisites: The first and for the most important point is, that it is in feature preview so just download the latest Power BI using following URL. Once you selected the option you might need to restart the power BI. Now, obviously the next step is to choose the source, in this example, I downloaded a pdf from the Internet and using it. In this data source, we have Employee(Contact Name), Title Company Name Country etc. Once you click on the option in the next step provide the source pdf file which needs to import. As you are aware we are importing Contact information related grid. 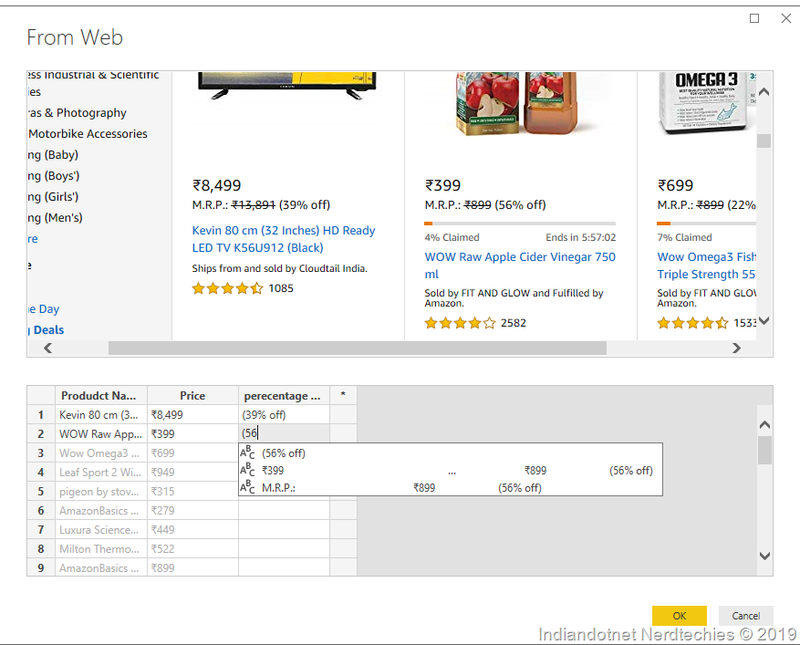 As you can see in below figure POWER BI imported various table in that specific table. Now, we have PDF grid data now in the next step just apply some steps to clean the data. 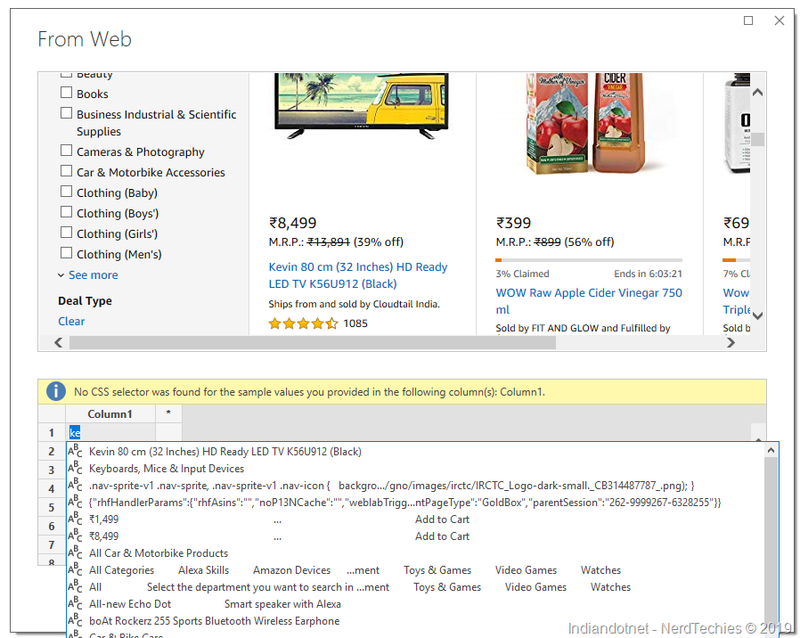 after a few steps like renaming the columns remove extract column and use column header etc. implementation we will get our grid of data imported from PDF. Now, we can run a chart to determine the contractor in each country. so, we have successfully gone through the option of import PDF DATA. Hope this will come in the main line data source soon. WordPress is well known CMS for the decade. I personally like it very much and using since 2008. With the help of Alibaba Cloud, you can set up your own WordPress which you can customize easily later on. To set up a WordPress ECS is very easy just follow the below steps to configure a WordPress ECS. if you remember my previous post in which I explained creating an ECS machine. We will follow the exact same steps to create a WordPress ECS. I hope you remember Elastic Computer Service (ECS). We are going to create a WordPress enabled ECS. Step 1: For this just log in with your credentials and go to console option. In which you have to select the Elastic Computer Service option from the menu. Step 2:- After clicking the ECS option you will get the following screen where you will find a summary of your existing ECS. Now Click on Instances option to view instances or ECS machine in the tabular format. Step 3: As you aware that we can create ECS and in any available region. Suppose if you want to see all the instances in Middle East & India ‘s India area then just click that option as shown in below image. 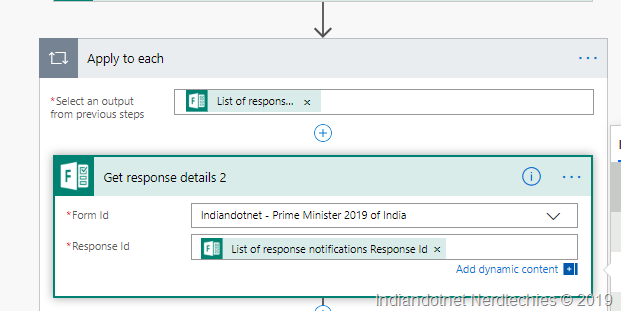 Step 4:- You will get all the instances which exist in the selected area in the below screen which you can manage any time. 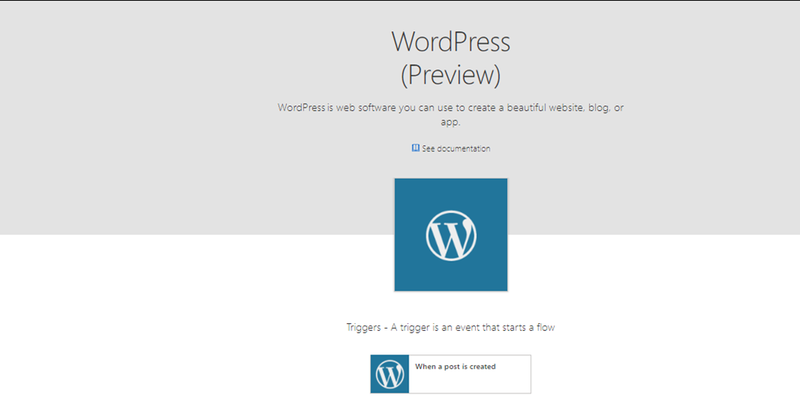 As we have created a new Instance for WordPress we will click on “Create Instance” button. Step 5: After clicking the button we will get a wizard where we have to select some specific values which we preferred. if you see in the first step we have billing Method option like Subscription or PAY AS YOU GO option which we can choose as per our ease. In the current example, I am using PAY AS YOU GO Option. 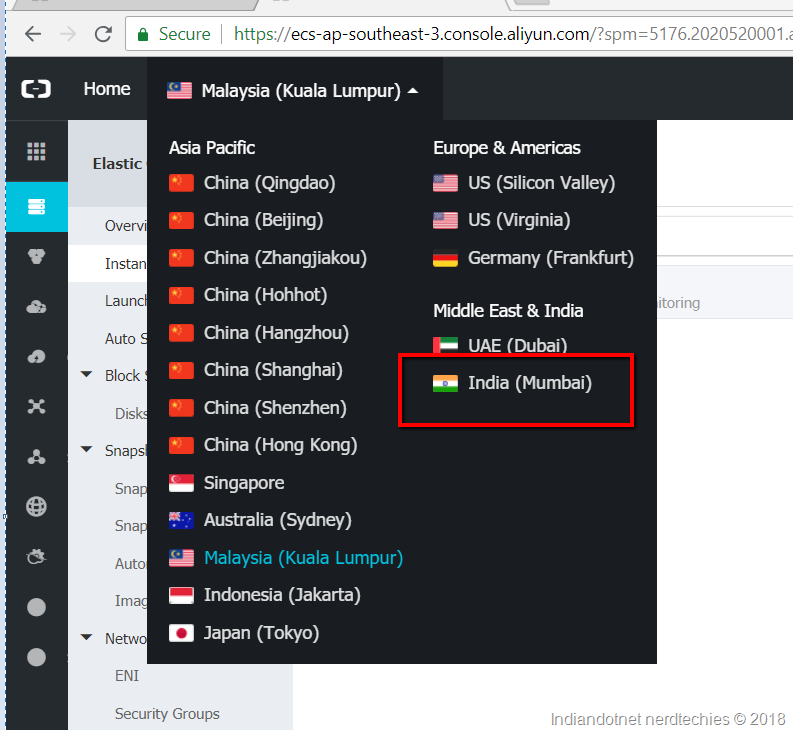 You can choose any region as well but my preference in Asia’s India area. As per your preference you can select no of CPU processor, RAM & Disk. for this demo purpose, we are choosing default minimum configuration. Step 6: In the next step we have to choose the image which we want on the machine. For this specific example for our ease, we are choosing option Marketplace image option where we will have a bunch of pre-generated images. Step 7: After clicking marketplace image button we will get the following screen. 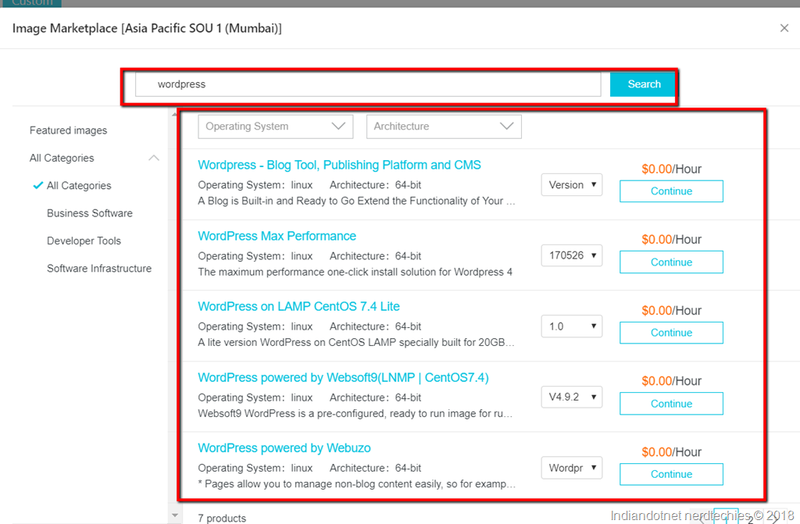 Just search for WordPress we will get options as shown below. You can choose any available free image as per your operating system preference. Step 8: Just click the “Continue” button in front of the selected image and you are good to go. After selecting image next step in choose disk which you can choose either Ultra Cloud Disk or SSD as per your need and any size. Step 9: in the next step just select the network and other options. in the current demo, we are just going with default. step 11: Now, when you click on next step you can configure the password as per your need. This password would be your machine’s password. step 12: At the end just review your configuration and click on create an instance. 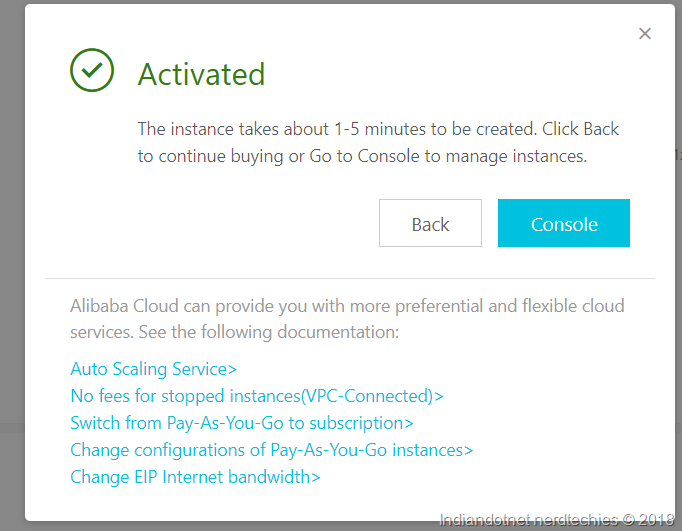 Step 13: You will get following popup window which states that the instance would be ready in 1-5 mins. 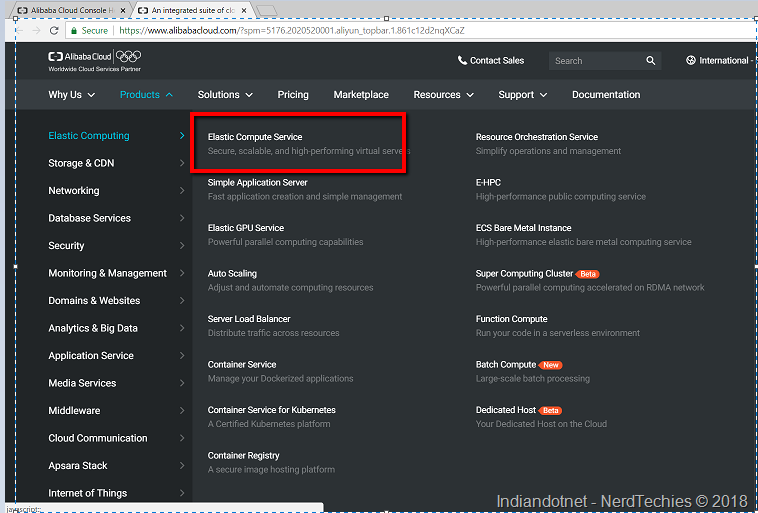 step 14: Now, when you go to console and select instances option which we did earlier in this post. You will find a new instance is up and running. If you see here you will find public and private IP address by which you can access the machine via RDP (if windows operating system) or Putty (if other) if required. step 15: Now, Just try to open public IP address in the browser. You will find the WordPress screen. Just configure it and we are good to go. You can see how, easy to create an ECS with WordPress enable. Please, do share your inputs.